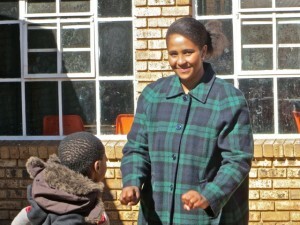 Mary was released as the branch Seminary teacher a couple of weeks ago. She decided she wanted to show her appreciation for the student’s support over the last 17 months by crocheting warm watch caps for each of them. 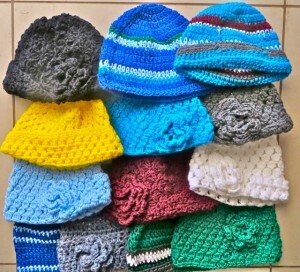 Altogether she made 13 caps – the young ladies get ones with flowers and the young men get ones with stripes. 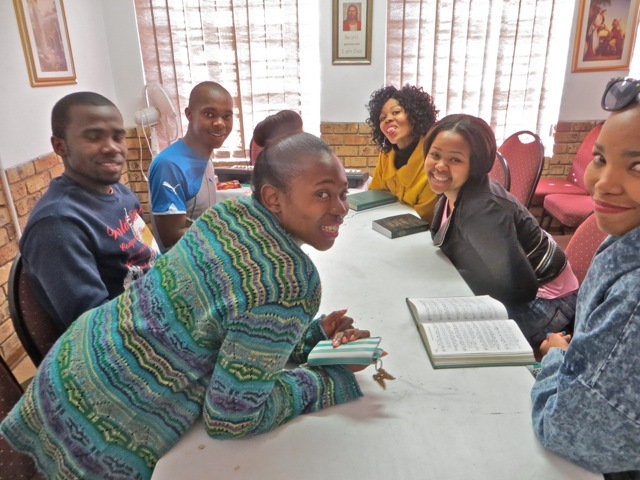 We will miss the couple of hours we got to spend with these special young people who are the future of the Church in South Africa. After seminary and cap selections it was time for photos and then a dozen games of Book of Mormon Bingo. 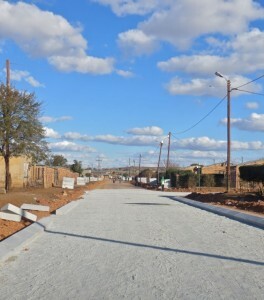 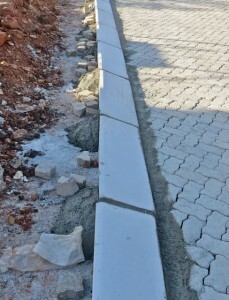 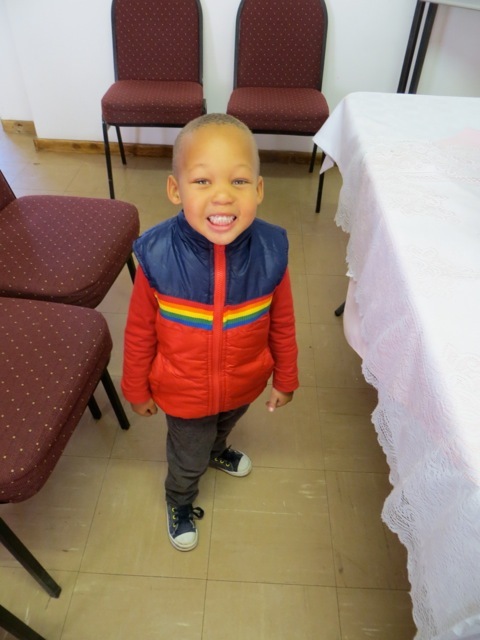 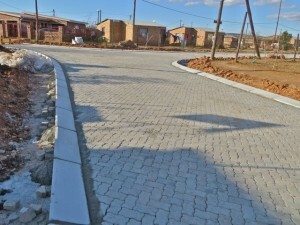 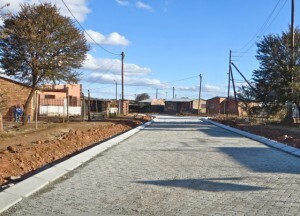 This entry was posted in Johannesburg Mission - Back To Africa on July 30, 2015 by Bill. 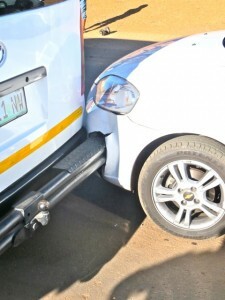 Opps – The Elders Have an Accident – but not their fault! 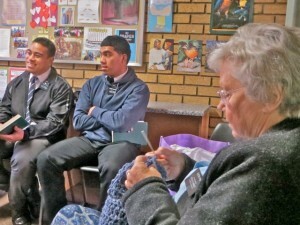 I called the elders to get them to help me with a project when elder Wild told me that they had just been in an accident. 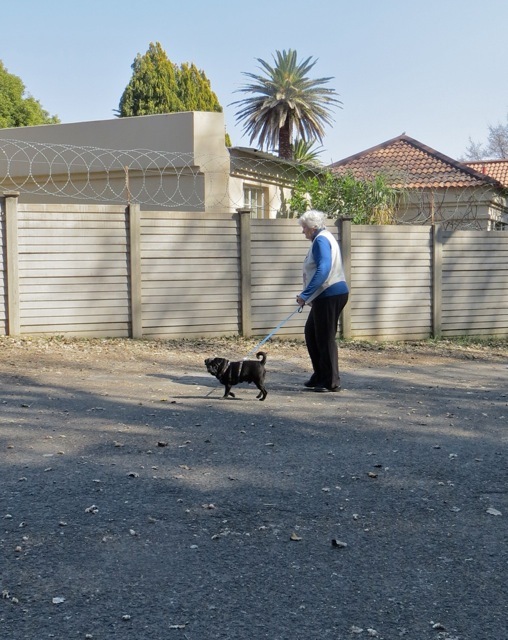 Mary got the location and knew where to go – she is my personal GPS, When we arrived we found that a taxi had backed into the front left side of their car. Of course the taxi driver said that they had run into him and none of the witnesses would make a statement to the police. 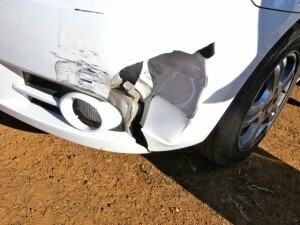 Besides the hole in the fender, the only damage seems to be that the washer reservoir was broken. 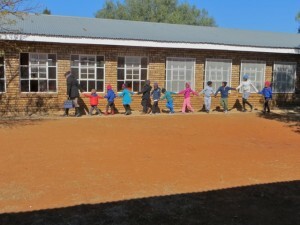 I told the elders to keep an eye on the heat gauge just in case the liquid that poured out included a leak in a hose to or from the radiator. 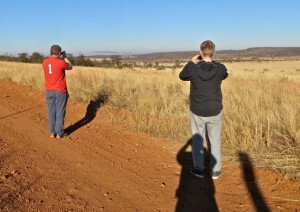 I took a couple of photos of some of the spectators. The little fellow in red was reluctant to have his photo taken but his big brother got him to pose. When I showed him his picture he got a big smile. 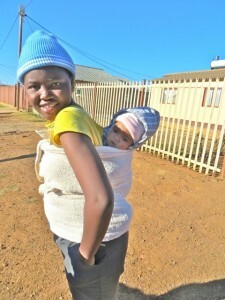 The young lady seems too young to have a child but here it happens regularly. 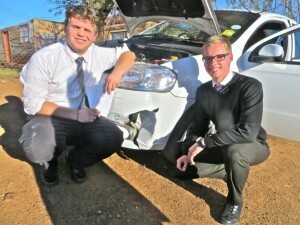 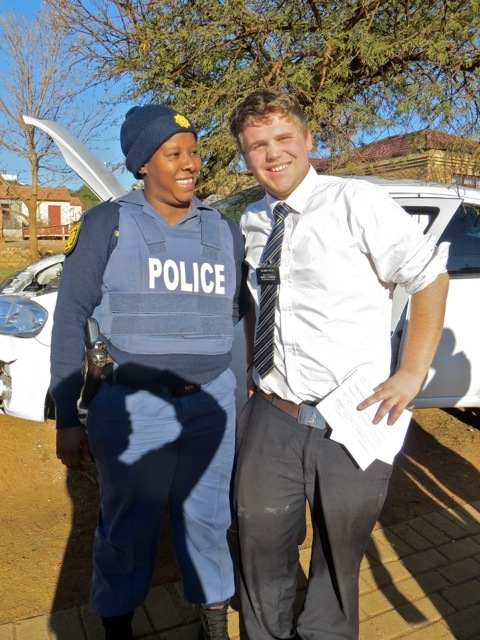 Elder Wild wanted a souvenir of the accident so he posed with the police officer. She seemed surprised to say the least. 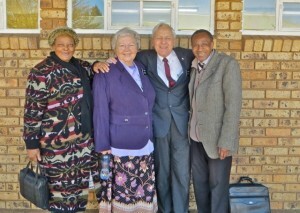 I had the elders pose with their damaged car. 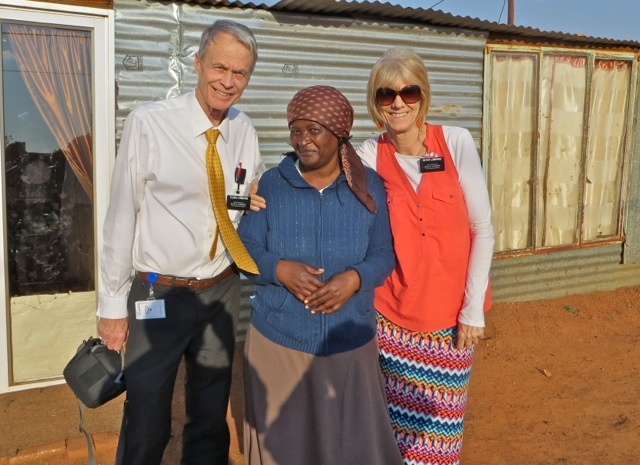 This entry was posted in Johannesburg Mission - Back To Africa on July 28, 2015 by Bill. 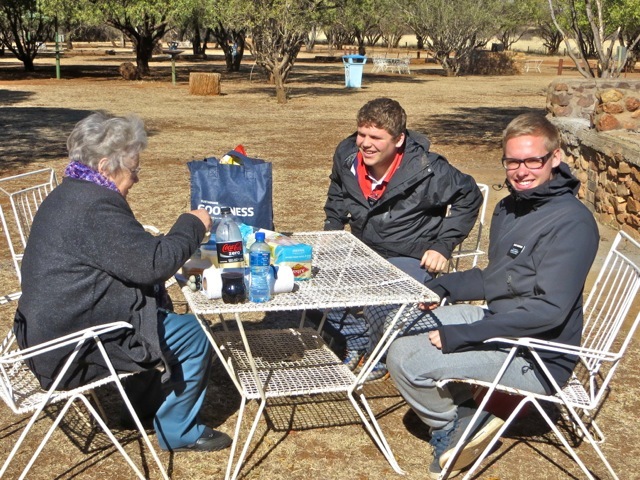 27 July – We go for a game drive with the Elders! We were talking to elders Wild, who has been here for over 22 months, and Hentunen, who has been here over a year, and found out that neither of them had ever been to a game reserve. 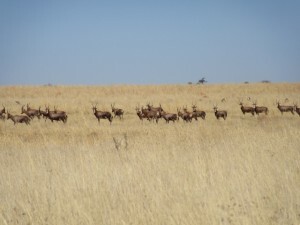 So we invited them to come with us to the small game park in our district. 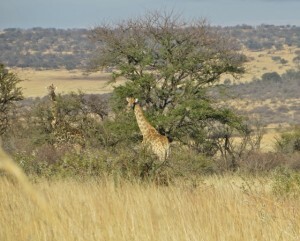 Mainly it has antelope, zebras, a few giraffes and three rhinos. 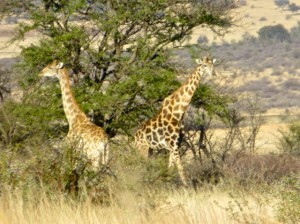 No cats and no elephants but at least it provides a touch of a major reserve. 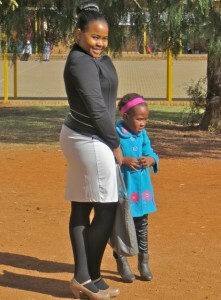 We left Potch at about 6:30 and were in the park a little after 7:00. The usual springbok was there to greet us. 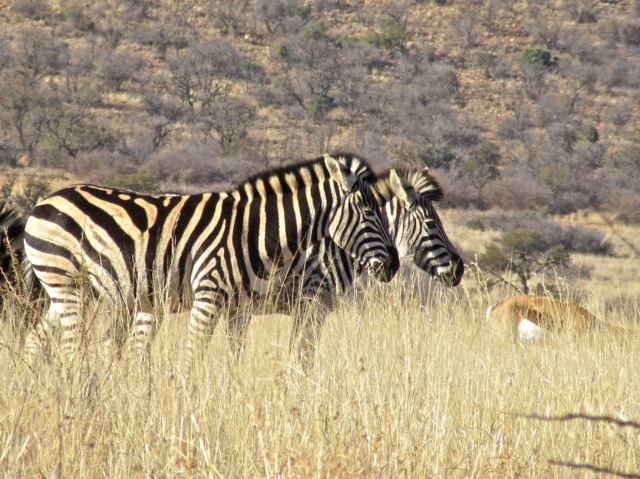 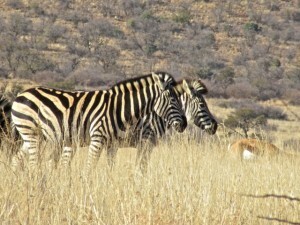 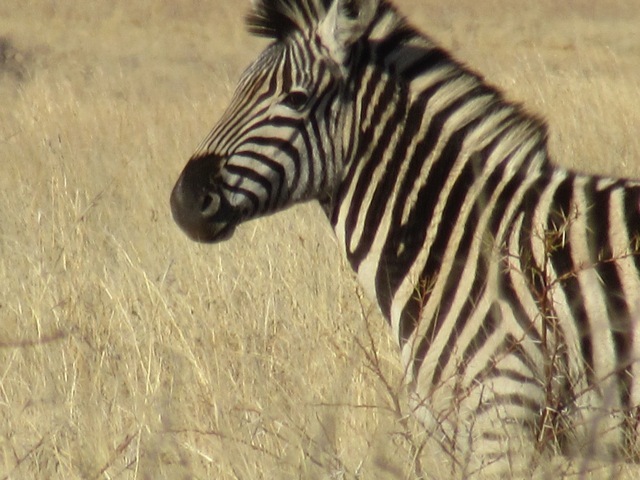 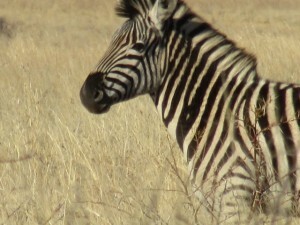 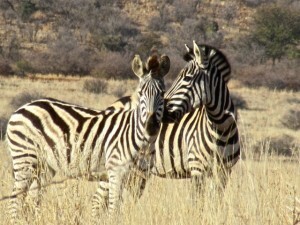 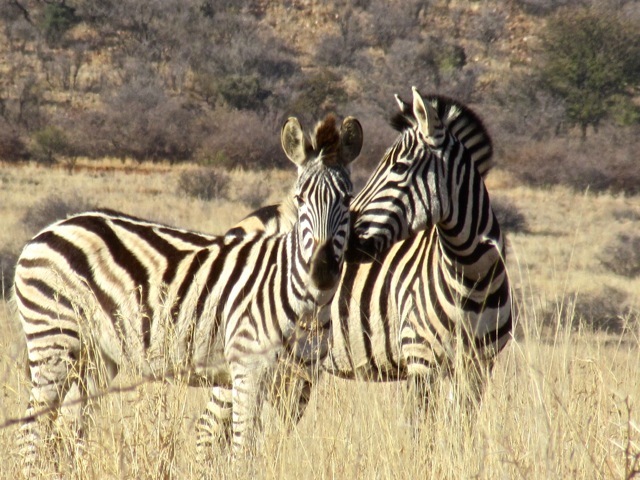 We saw a couple of small herds of zebras. 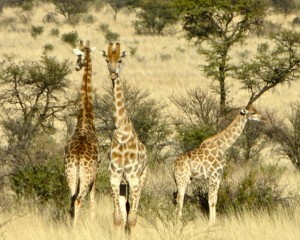 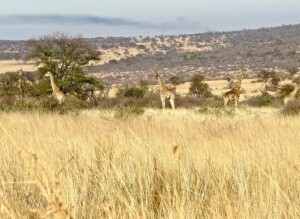 But the main attraction was a family of 6 giraffes that elder Hentunen spotted and we all took lots of pictures. 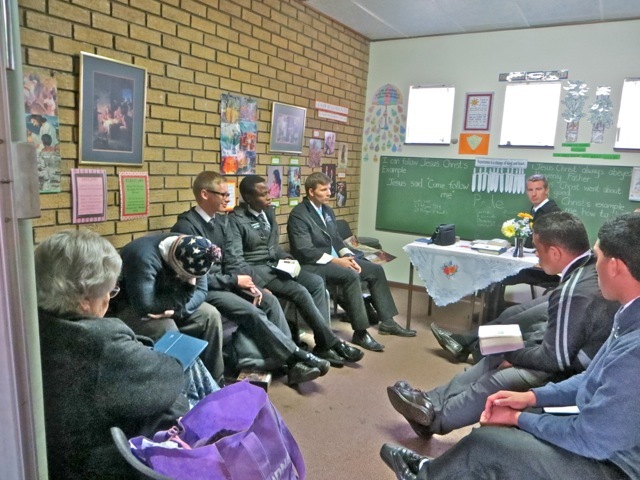 Notice that elder Hentunen who is from Finland had on a coat while elder Wild who is from England just had on a short sleeve shirt. 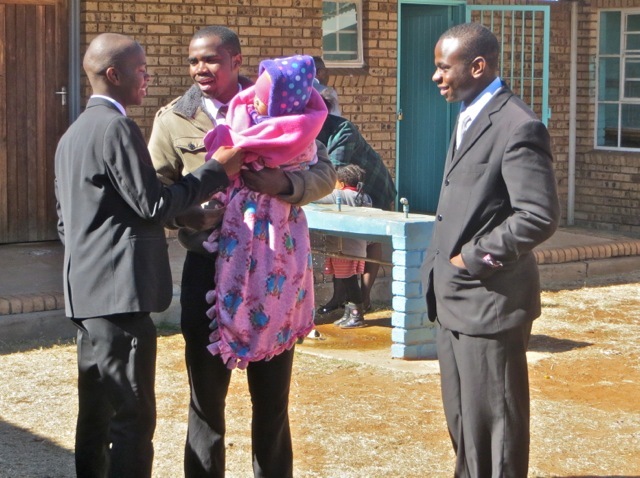 Later elder Wild got cold and put on his jacket. 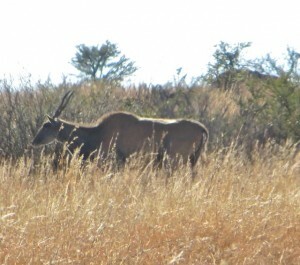 The group included an old dark male that is almost invisible in the first couple of photos. 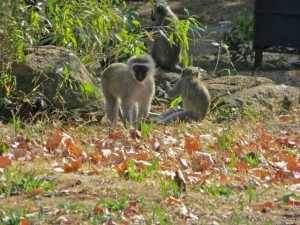 There seemed to be 4 adults, a juvenile and a younger one. 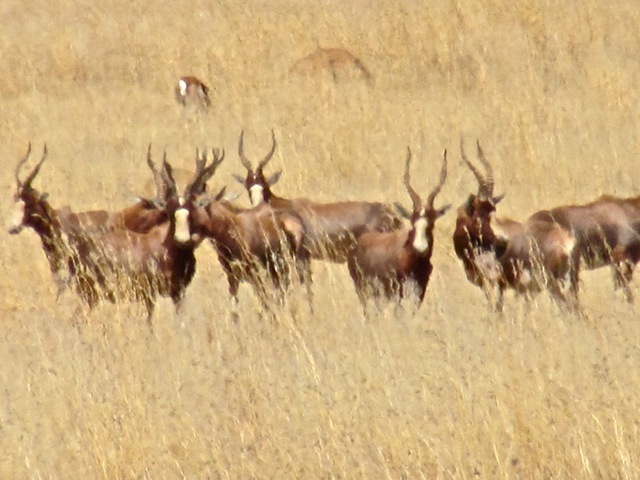 in the group. 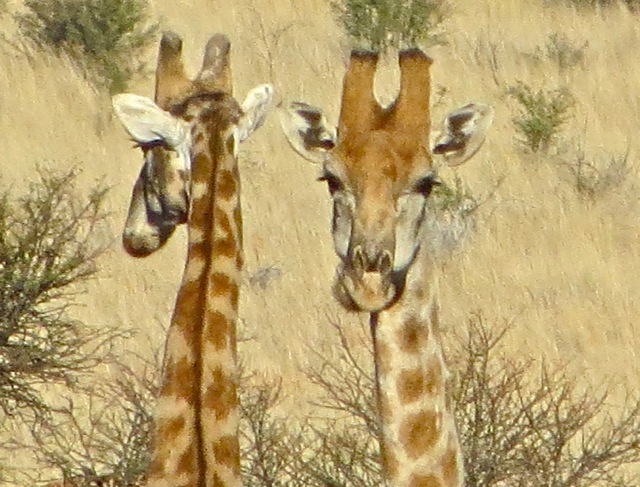 I got some good shots of a pair of them that look like the front one is standing in front of a mirror. Later we saw the same group silhouetted against the skyline heading across the plains to another group of trees. 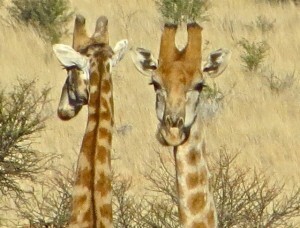 The big male was in front followed by a female and the juvenile. 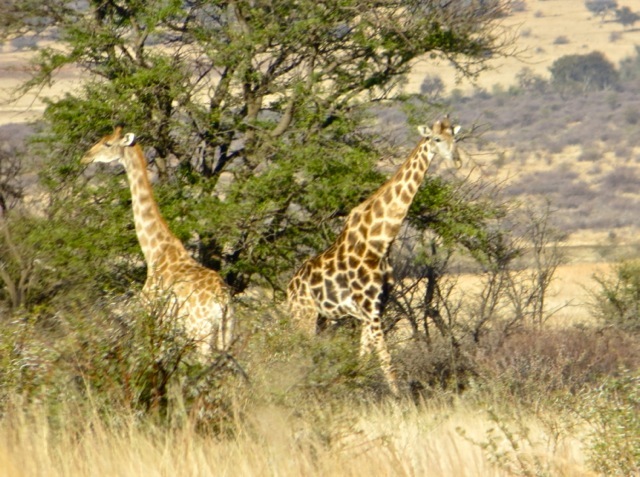 In the last photo you can see the littlest giraffe plodding along behind. Mary had put together a nice lunch of sandwiches, chips and chocolate. 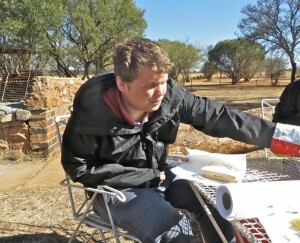 I had stopped and bought some soft drinks. 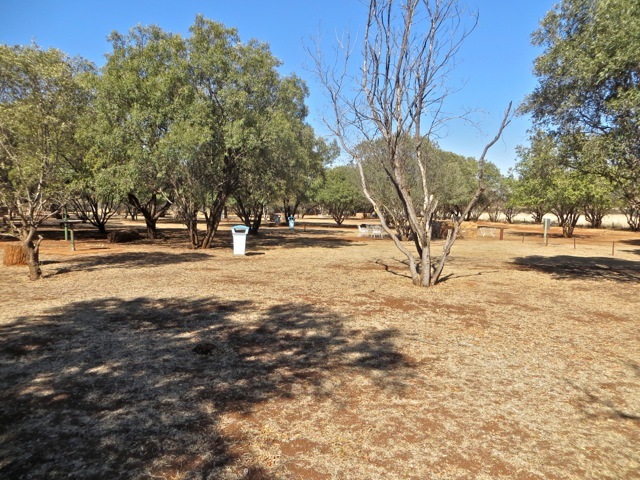 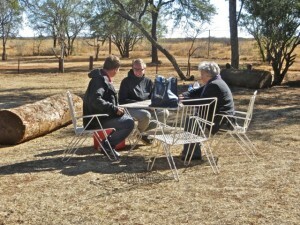 There is a large and very picnic area with comfortable tables and chairs, braai pits, toilets and lots of shade. 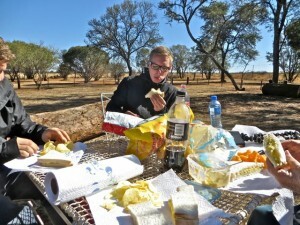 But today it was cold and windy so although we ate in the sun, we still were rather chilled. 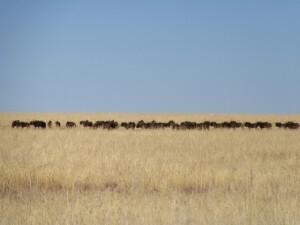 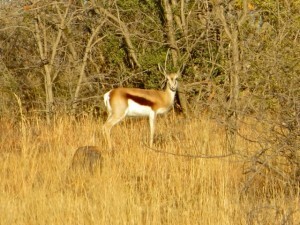 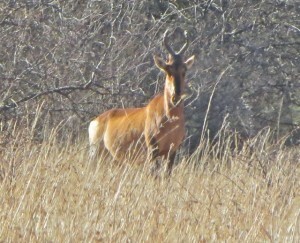 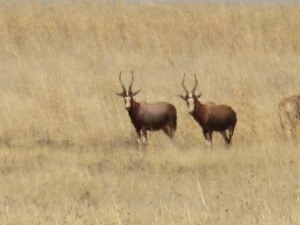 As we were driving along one edge of the park we came to a plains area that had three large herds of antelope. The largest were wildebeests and bonteboks – there was also a herd of impalas but I did not take a photo of them as they were even further across the plains. 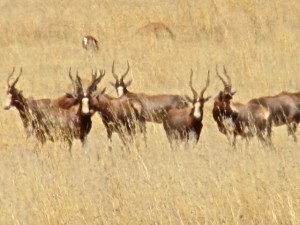 We decided they were all there because of the watering hole that was near by. 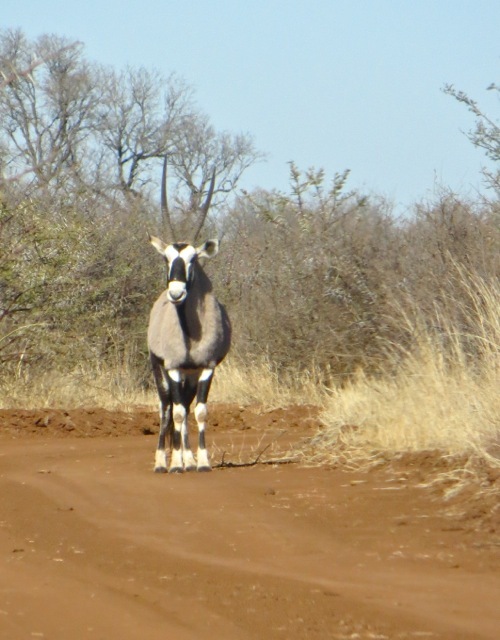 This Gemsbok was nice enough to stay standing in the middle of the road so that I could take a nice head on shot. 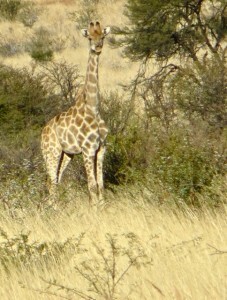 Later we got a side photo of another one. 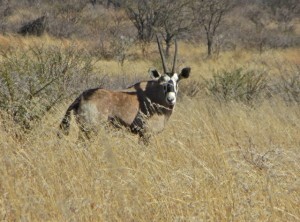 Notice the size of the horns on this antelope. 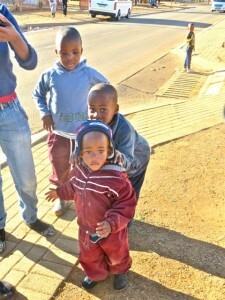 I would not want to get one of them mad at me while I was outside. 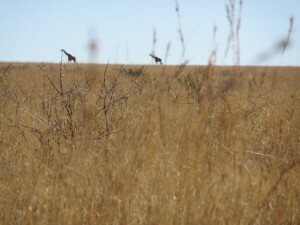 This is the only photo of a bird that I got. 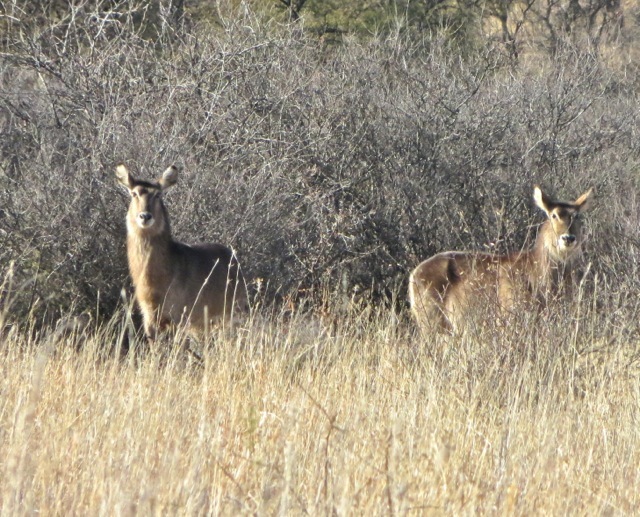 I tried to shot a couple more but they flew away before I could take their pictures. 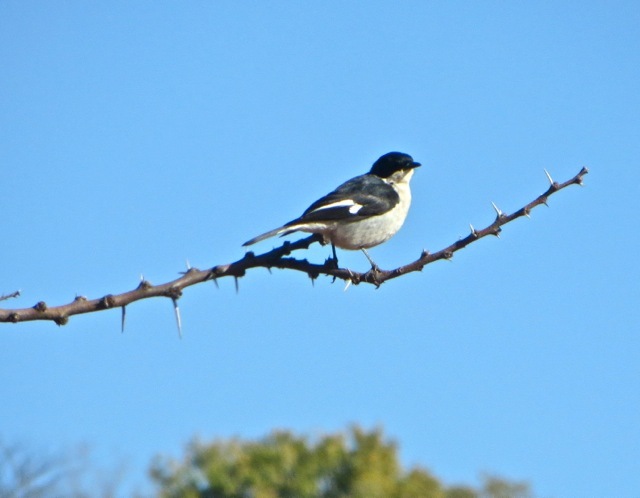 So this Fiscal Flycatcher is has to represent all the birds in the park. 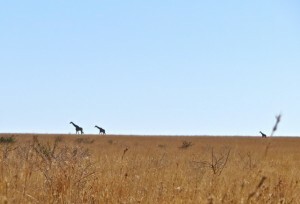 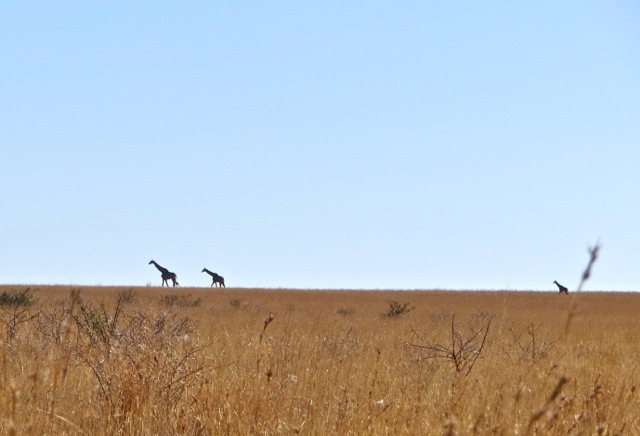 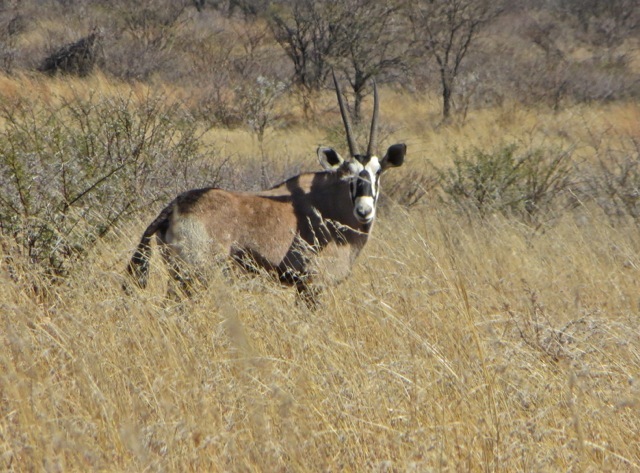 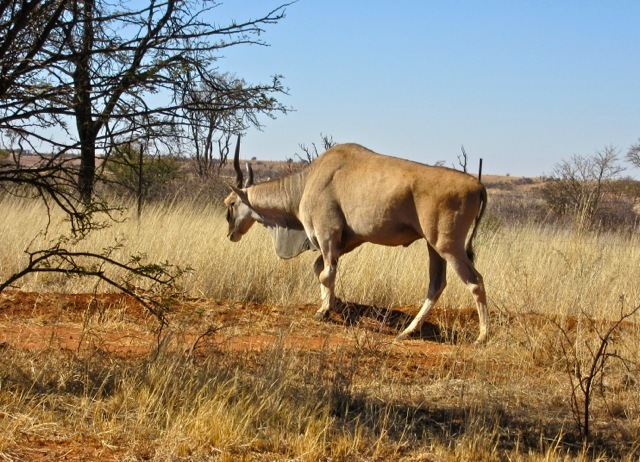 We had not seen any eland – the largest of the antelope – on our other trips to the park but this time we saw a couple – one walking through the grass at a distance and the other one quite close and personal. 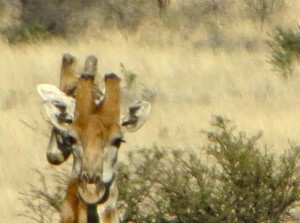 Notice that his one has a broken horn on the right side. 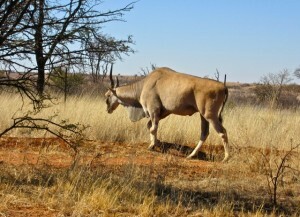 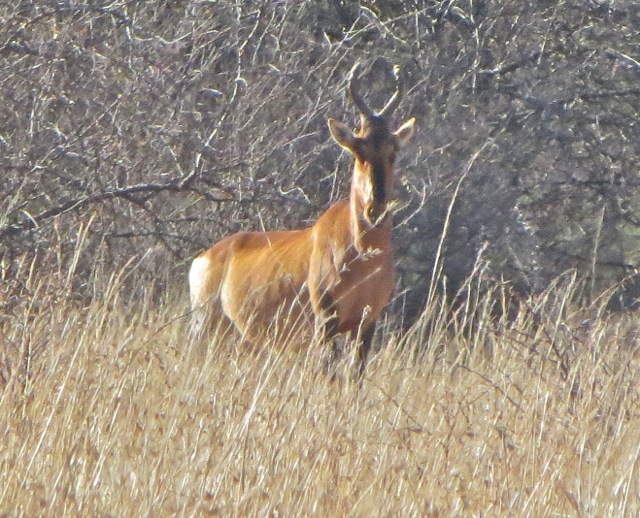 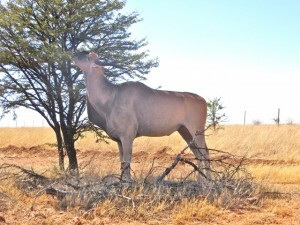 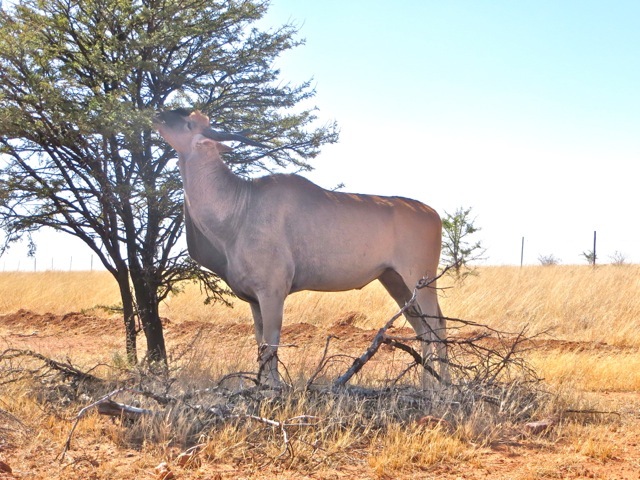 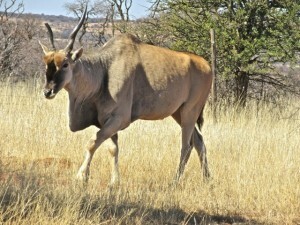 This is a common eland – there seems to be some uncommon versions around. This entry was posted in Johannesburg Mission - Back To Africa on July 27, 2015 by Bill. 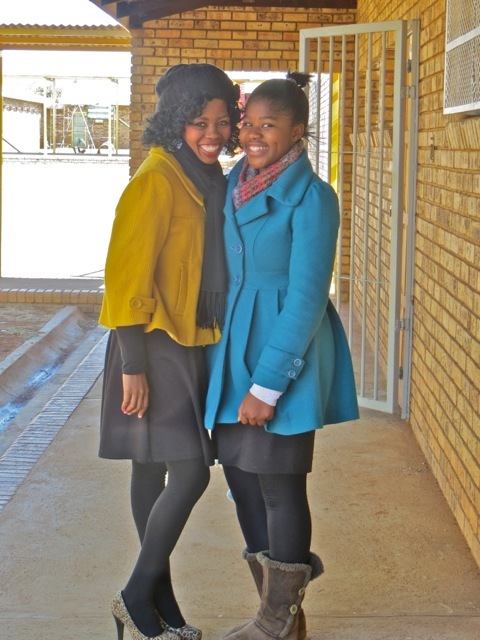 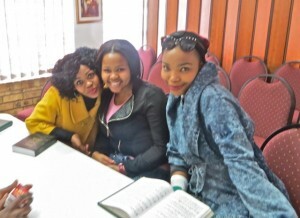 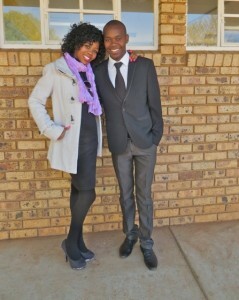 It was freezing cold this Sabbath morning due to low temperatures and a biting wind. 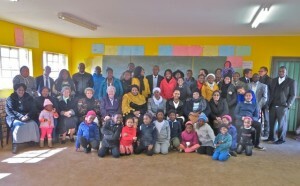 I really did not expect many of the members who had to walk a good distance to come but 55 great saints braved the cold and wind to come to our meetings. This says a lot for the faith of the saints here in Ikageng and Potchefstroom. Between meetings the courtyard was busy with people trying to get a little warmth from the sun. 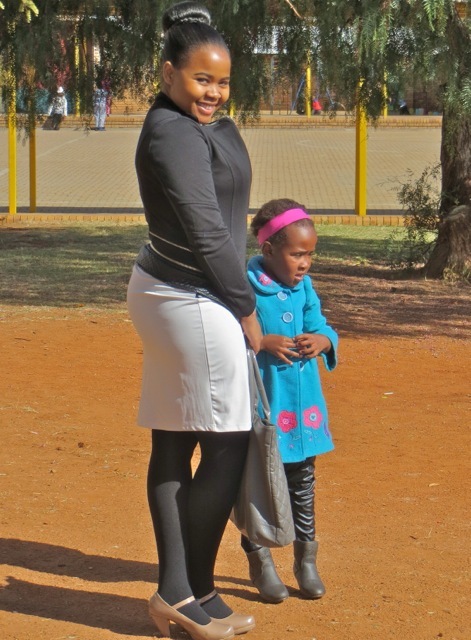 Sister Merriam in her sharp looking check coat and sister Kea who was watching over a young sister caught some sun. 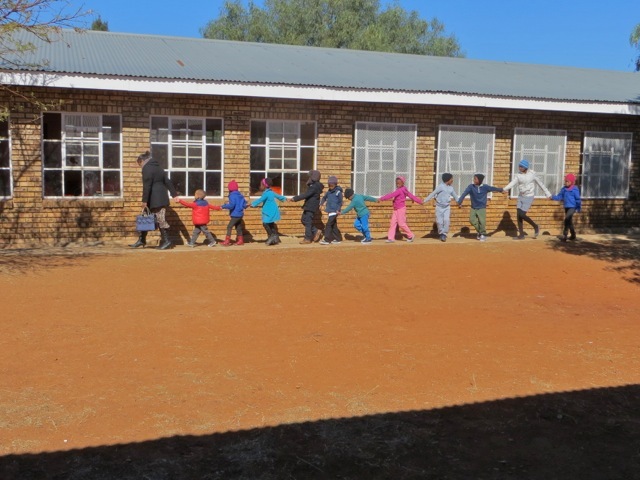 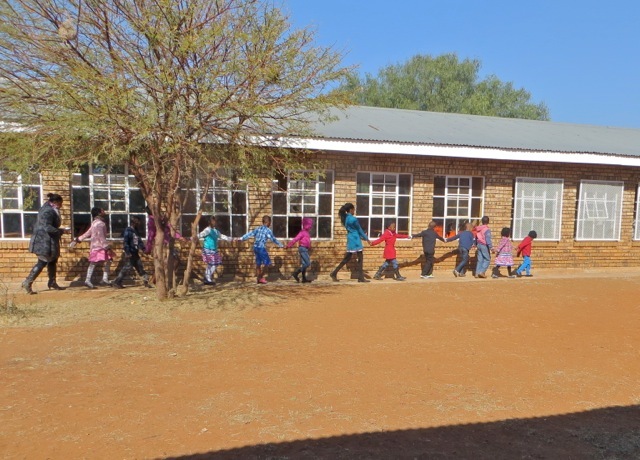 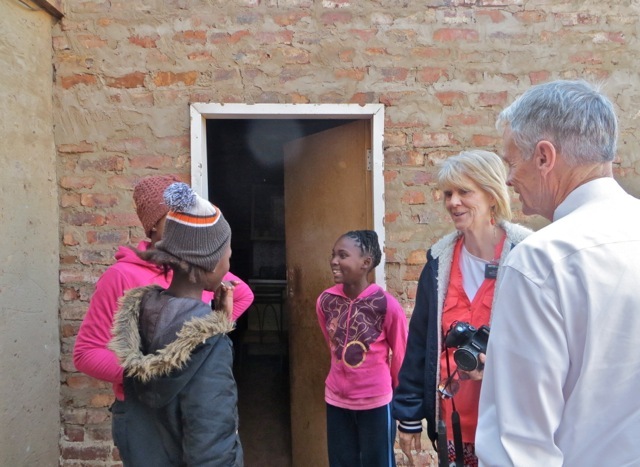 The wonderful primary presidency leads all their charges to the toilet while sisters Kruger and Ncapayi share some thoughts. 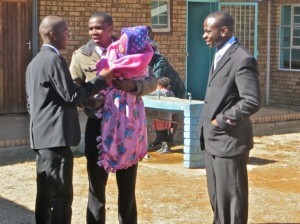 Brothers Omphile, Gomolemo and Tinashe seem to be talking about the little one. Sisters Ratema and Lekebe pose for me while president and sister Kwaikwai try get a couple of moments alone. Sister Kujane and the other sister Lekebe in the sun while we pose with brother and sister Tlotleng. 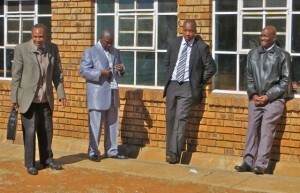 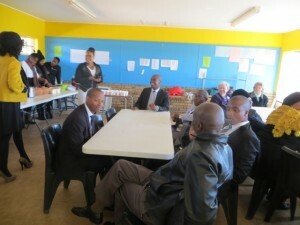 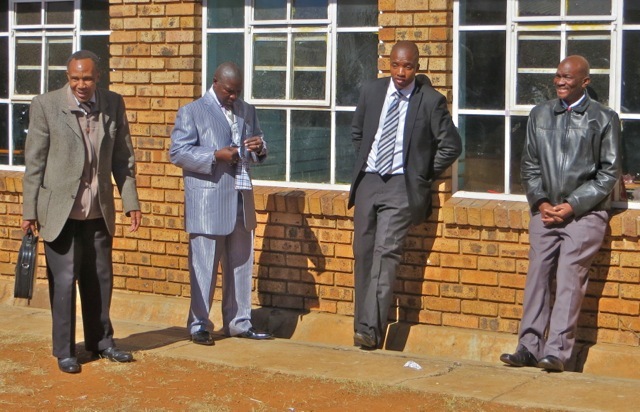 There is a small gathering of the priesthood, brothers Tlotleng, Johannes, Komatso and Rampai. 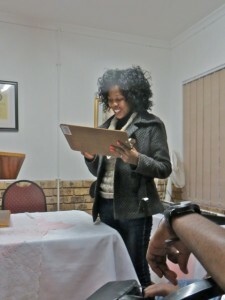 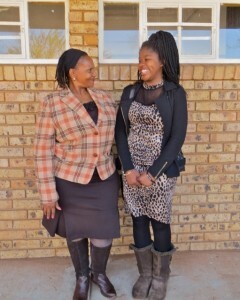 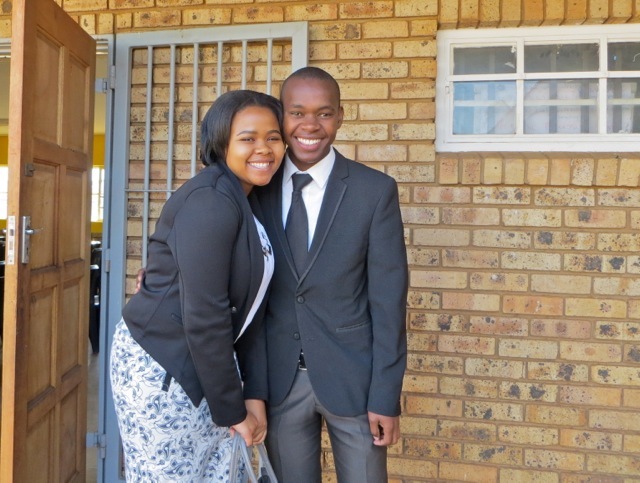 It would not be a Sabbath with out a photo of sister Thulo. 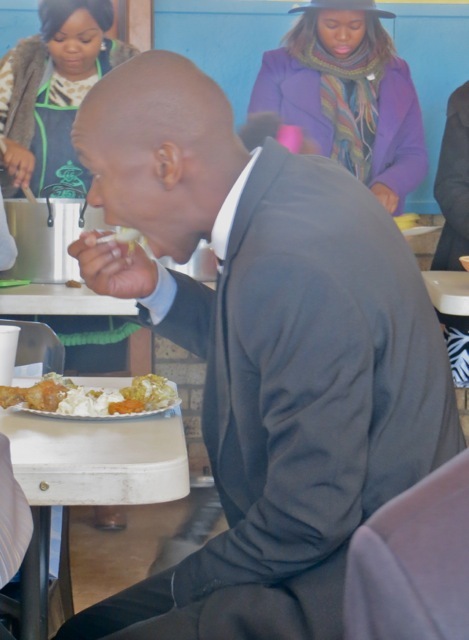 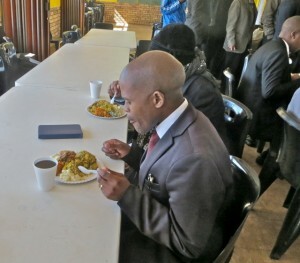 The youngest Thulo gives me a smile while president Kwaikwai is caught trying to get some lunch at the social for brother Omphile Mokate’s farewell. 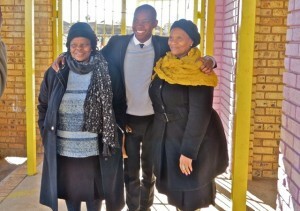 Speaking of brother Mokate here he is with sisters Williams and Thulo and then with Kea and a young lady I do not recognize. 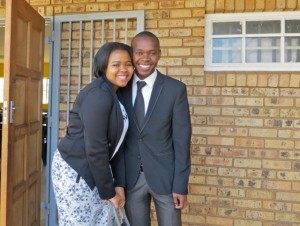 Then he is with us and finally sister Ratema. 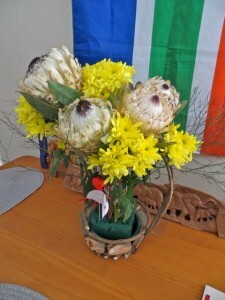 The Kruger family gave Mary this beautiful flower arrangement for her birthday.. 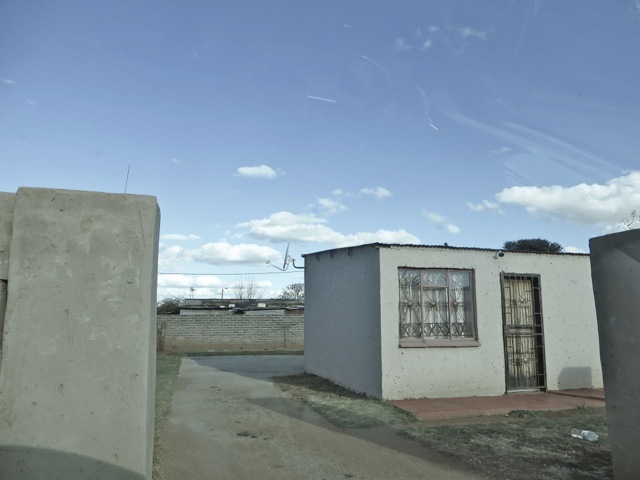 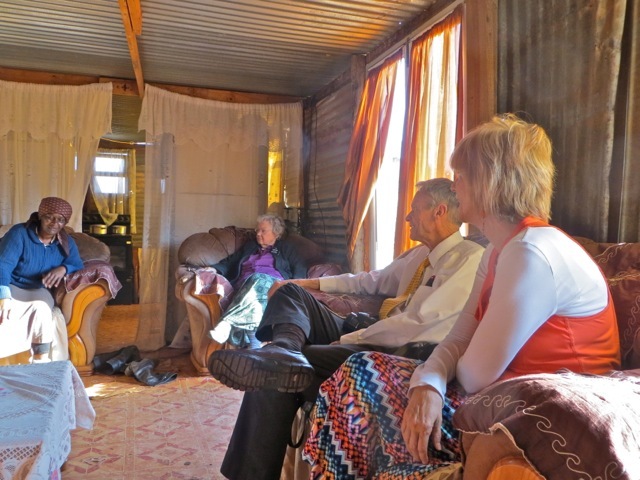 This entry was posted in Johannesburg Mission - Back To Africa on July 26, 2015 by Bill. 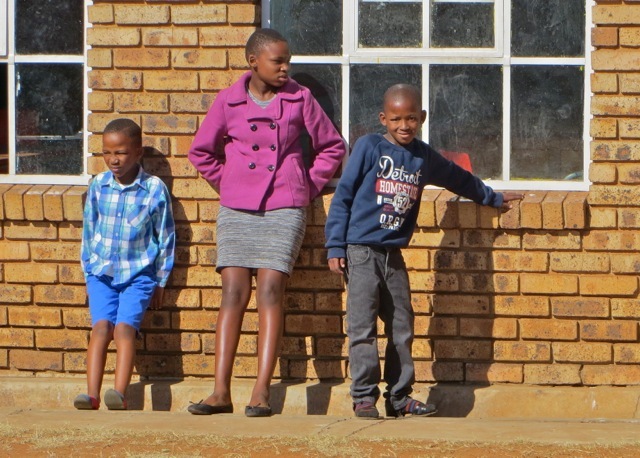 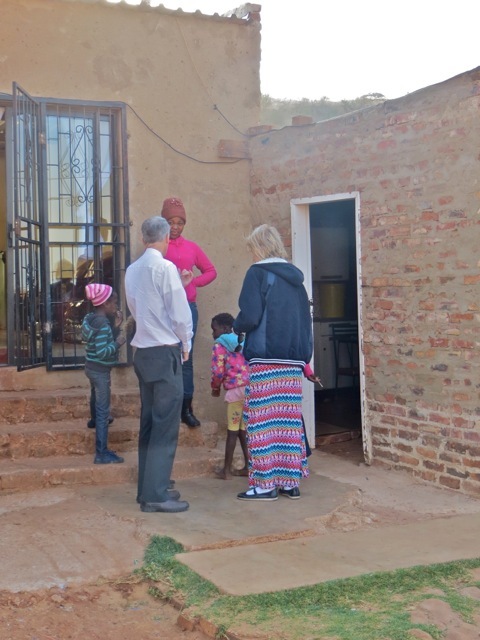 This entry was posted in Johannesburg Mission - Back To Africa on July 25, 2015 by Bill. 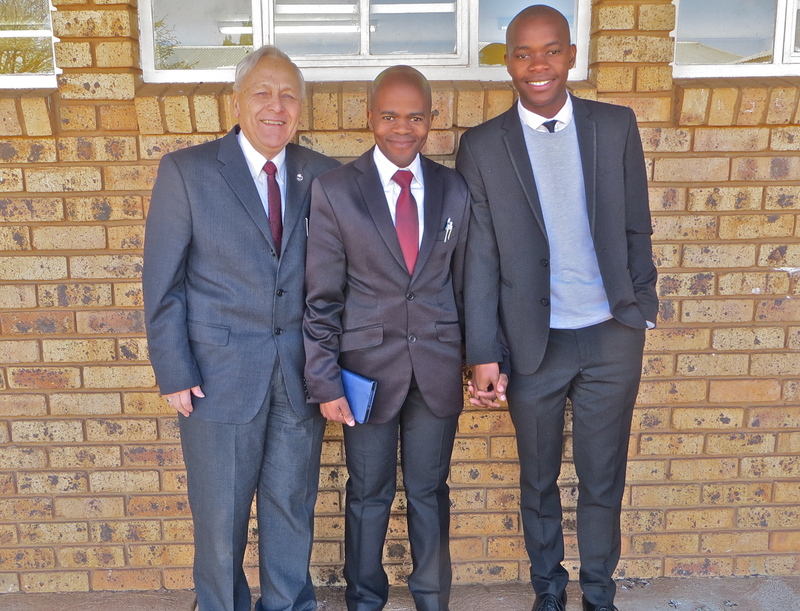 We have visitors…meet the Lombardis! 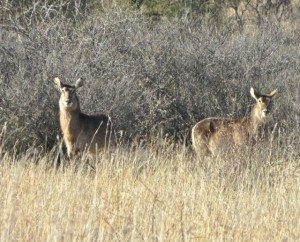 We had visitors today – only the second time that some one outside our zone has come to see us. 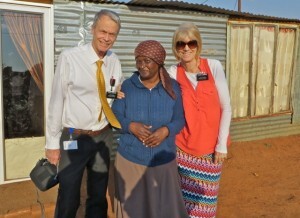 We served in the same mission as Dennis and Taunia Lombardi but at different times. 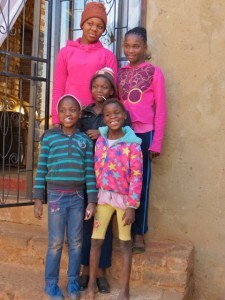 We got to know them through FaceBook and they were kind enough to help me replace my favorite Swaziland silver ring when the one I bought there in 2009 got damaged. 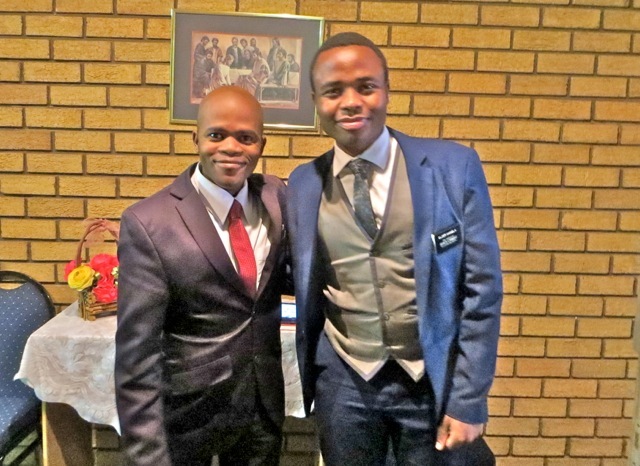 They are now serving their second mission in South Africa. 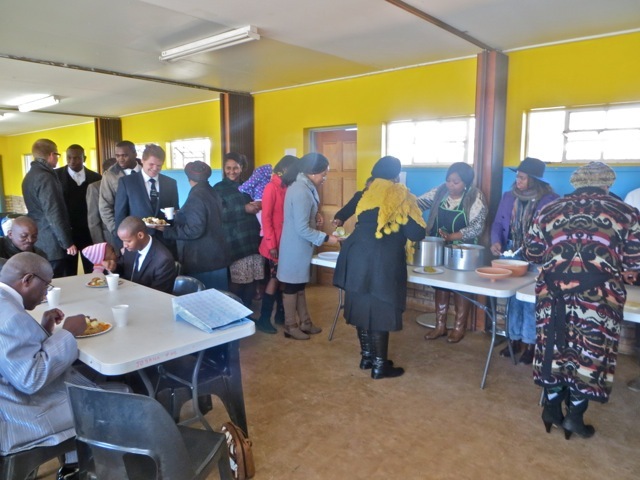 The first one was served in the Durban mission and they spent their 18 months blessing the lives of the members, missionaries and others in Swaziland. 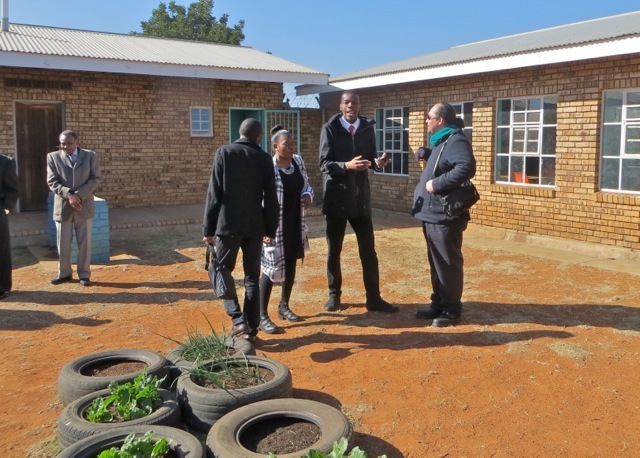 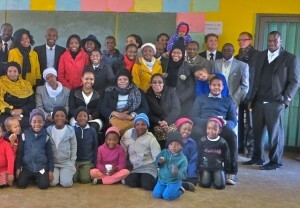 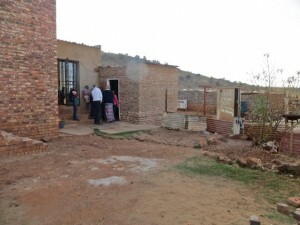 This time they are serving in the Area offices in Johannesburg as Church History Advisors. We dropped in to see them in their office a couple of weeks ago and they returned the favor today. 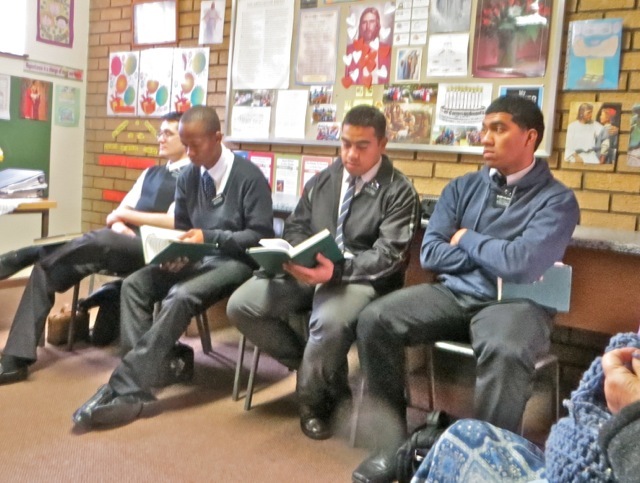 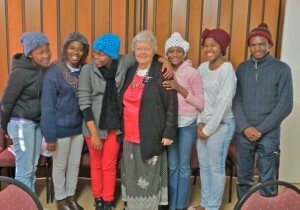 Sister Lombardi said that they missed working closely with the young missionaries and the people. She also mentioned she missed the dirt roads. 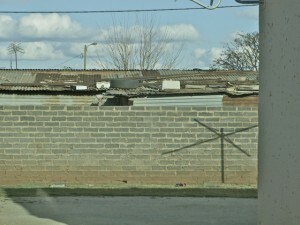 So we invited them to take a quick tour of Promosa and Ikageng where we would be happy to get them on some dirt roads. 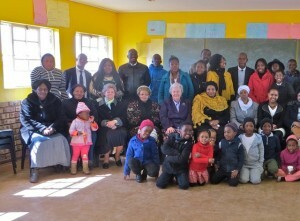 Our first stop was in Promosa where we visited our dear friend sister Mary Mothobi. 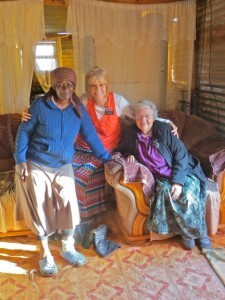 She lives in a humble home but it is filled with love and the spirit. We then directed them – elder Lombardi was driving – to the orphanage that we give a little support. 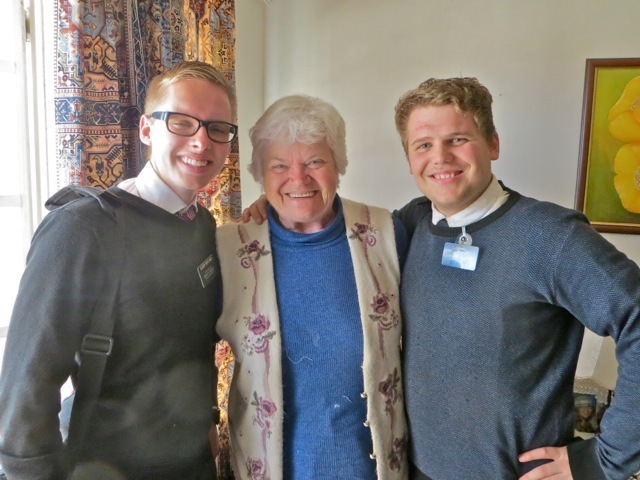 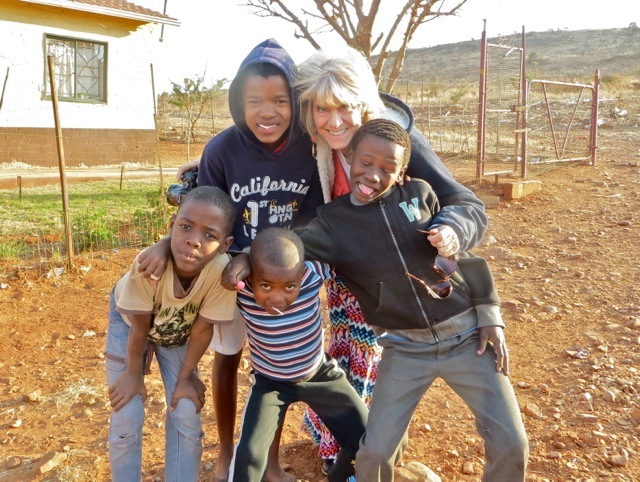 Sister Lombardi was in heaven when she found a group of young men playing on the dirt road. They have a big bag of lollipops ready to hand out to the children. They were equally as pleased to meet some of the children who live at the orphanage. 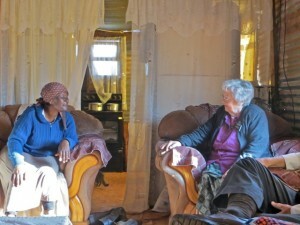 Unfortunately neither Lolo or George were home but Lolo’s daughter was there to answer all their questions. It was a fun afternoon for us and I think that this brief trip to the real Africa that they saw every day in Swaziland kind of recharged their batteries. 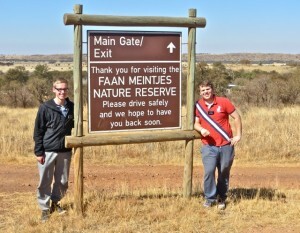 We invited them back any time – at least up until we leave for home. 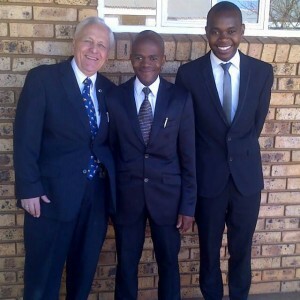 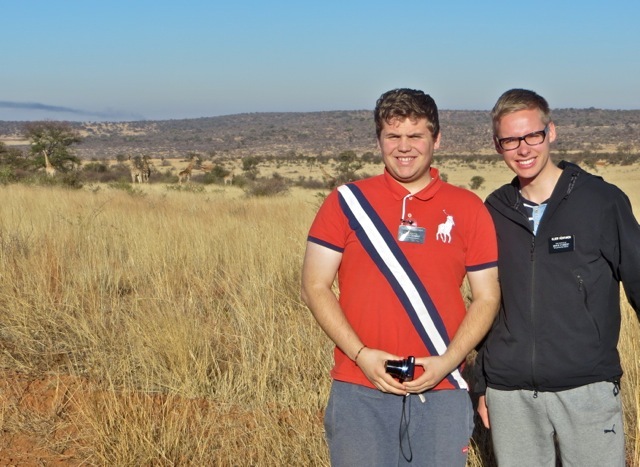 This entry was posted in Johannesburg Mission - Back To Africa on July 22, 2015 by Bill. 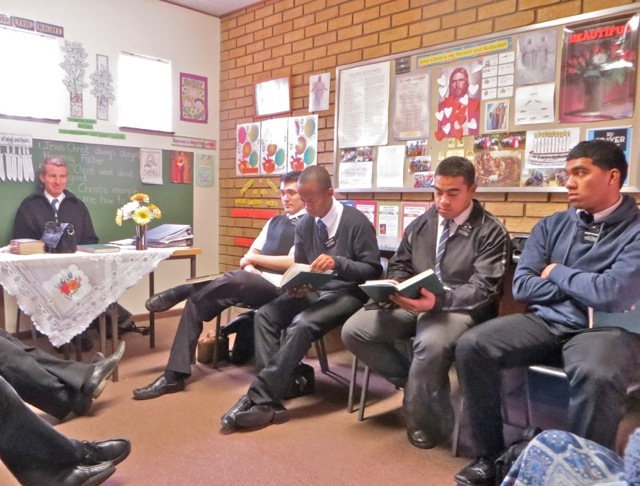 Monday night is YSA Family Home Evening time at the branch. 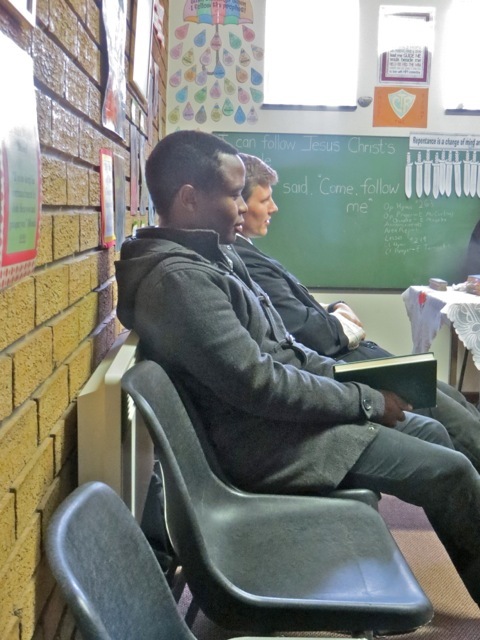 Sister Ratema conducted the meeting and sister Kwaikwai thought a lesson on Tithing and Keeping the Sabbath Day holy from a talk by elder Bruce R. McConkie given at BYU 40 years ago but just as relevant today as it was then. 10 Commandments After the lesson the group settled down to a couple of intense games of Book of Mormon “Go Fish” which is a favorite of the group. 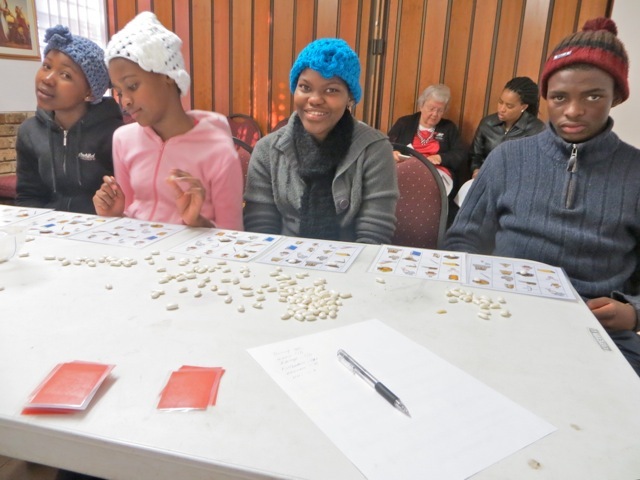 Sister Kwaikwai cleaned up in the first game having accumulated 7 sets with the next best being 4! 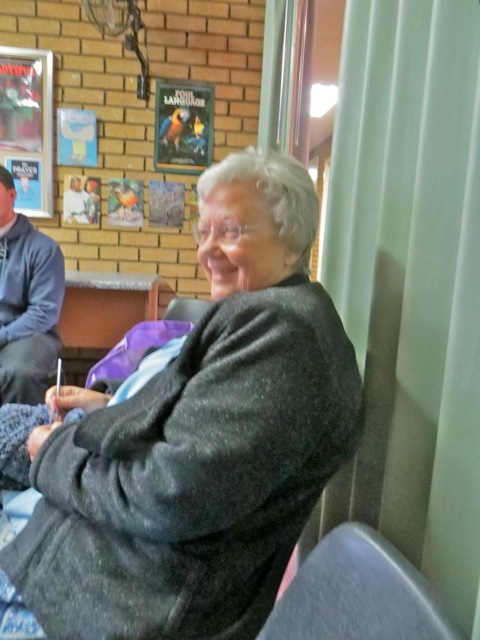 On Tuesday we picked up elders Hentunen and Wild and took them up to Parys to visit sister Bobbi Swanepoel and Louis. As we were driving into the town, elder Wild spotted a group of monkeys so we stopped and took some pictures. Elder Hentunen is from Finland and elder Wild is from England…they make a great companionship. After our visit we walked down to the Vaal River that runs behind her flat. 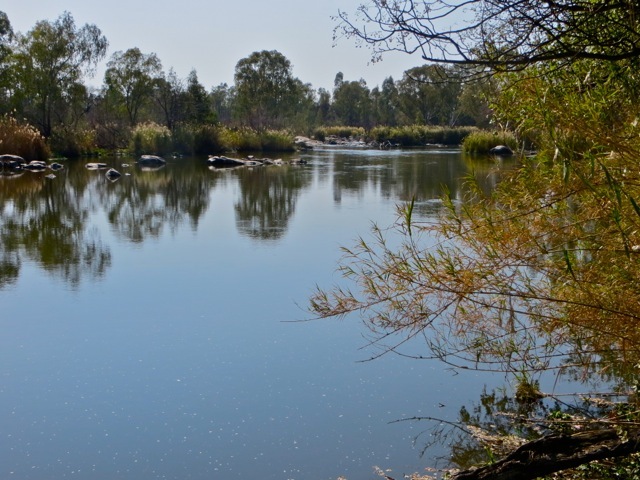 It was a beautiful day and the river was as smooth as glass. It is also very low for this time of the year. 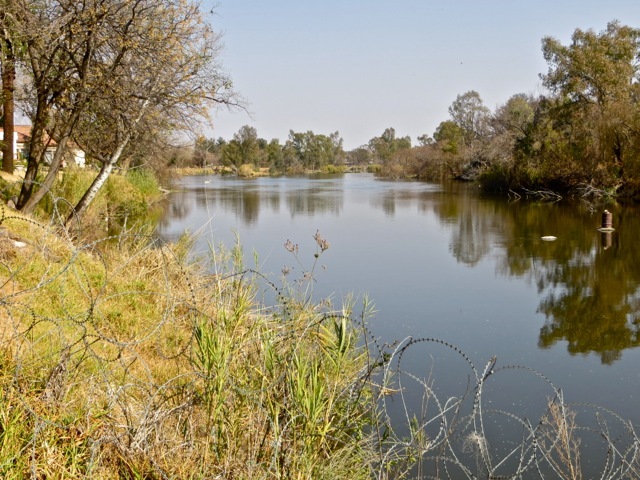 If you look really closely at the photo on the left you can pick out a man paddling a small kayak down stream. 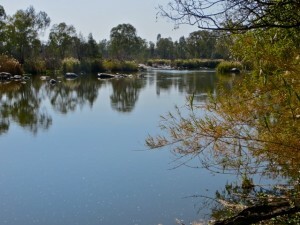 The other photo is from the same spot but looking up stream at a small rapids. 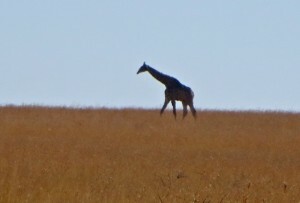 Usually I get a couple of photos of Louis but this is the only one I took this trip. He is leading sister Bobbi back to their flat. They make a great pair and we have been blessed to know them. 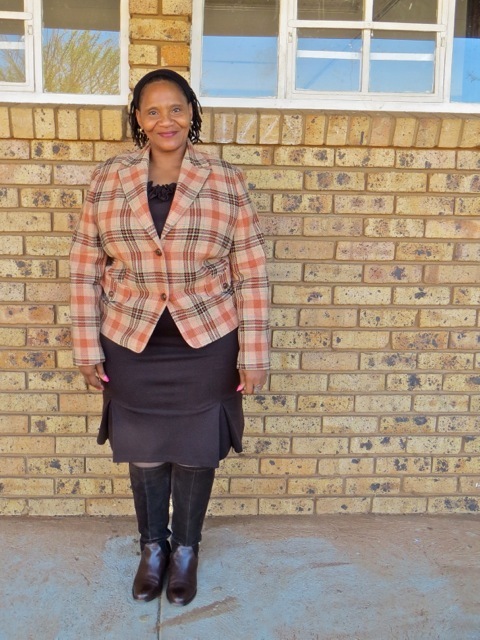 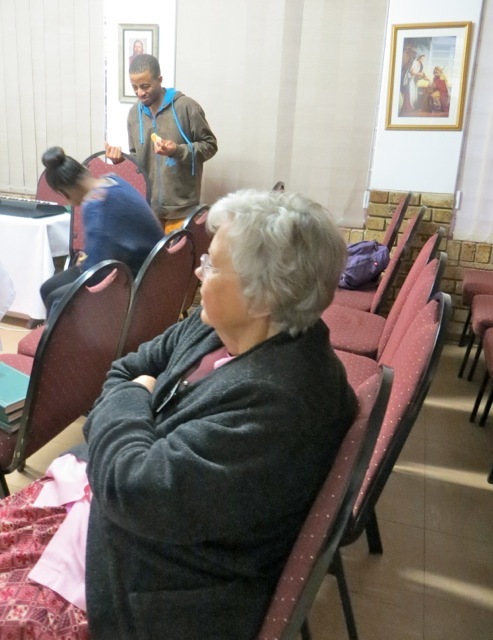 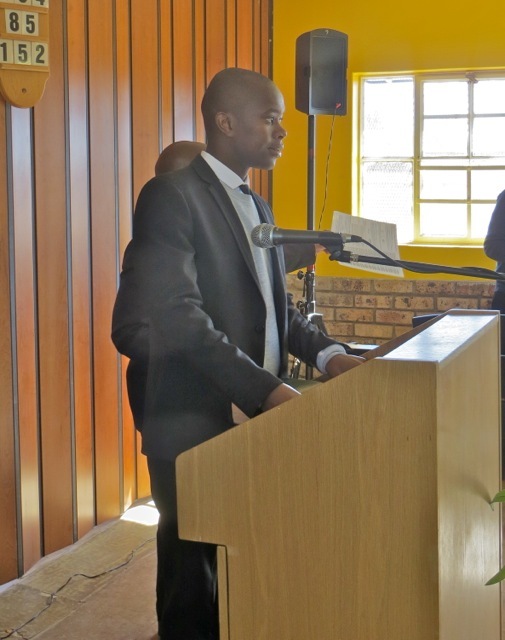 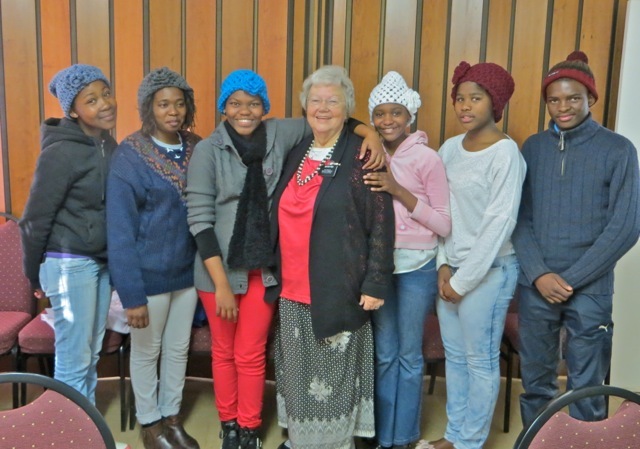 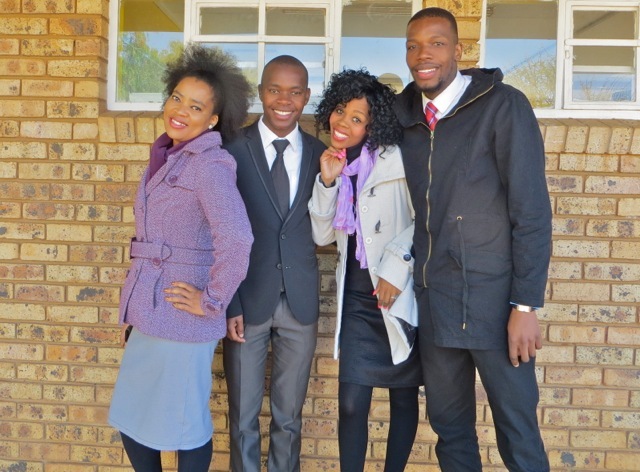 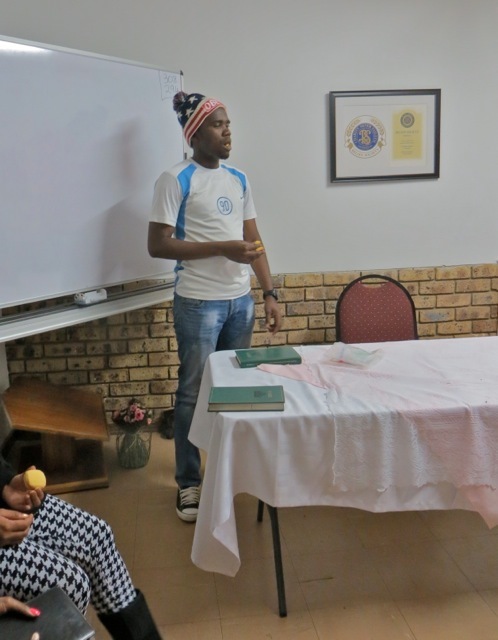 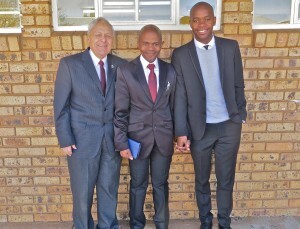 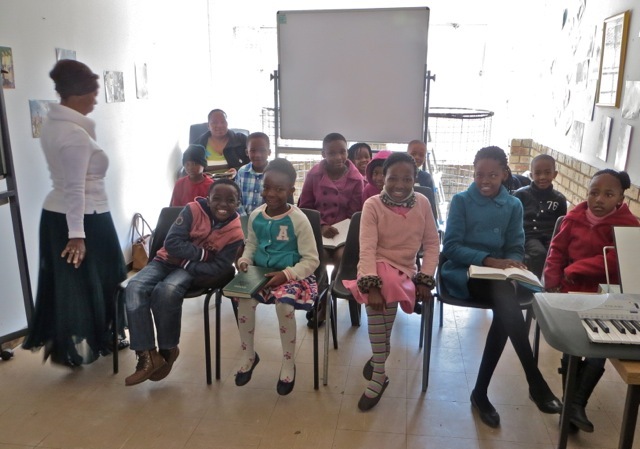 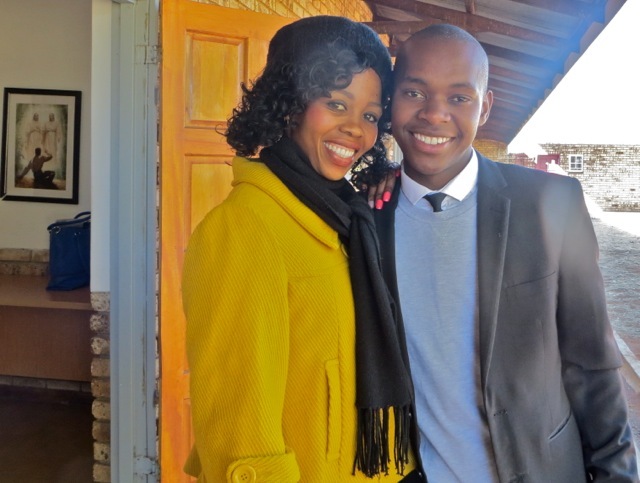 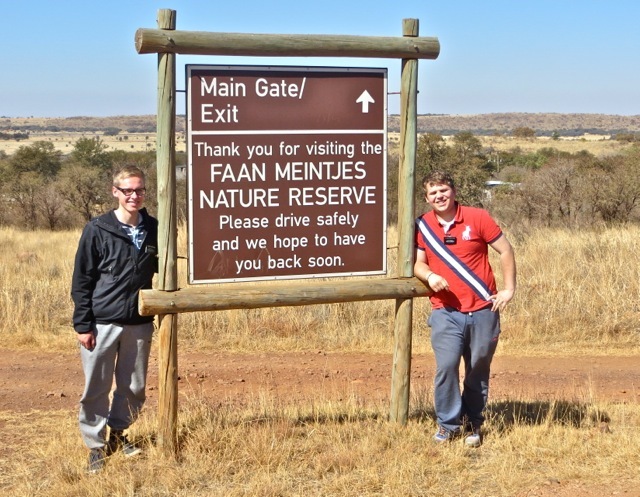 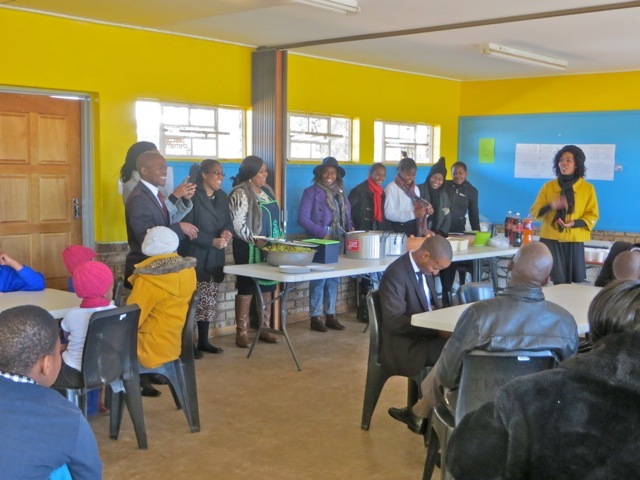 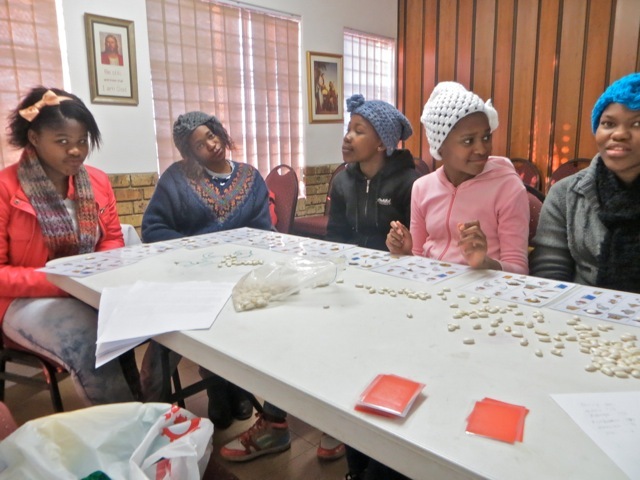 19 July 2015 – Another Beautiful Sabbath in Ikageng! 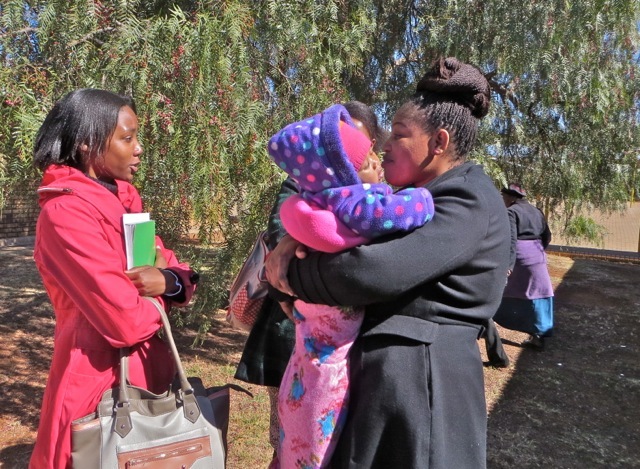 Sunday was clear and cold but over 50 members of the branch came to Church to enjoy the blessings of the sacrament and the fellowship of the saints. Due to load shedding the heaters stopped working about 30 minutes before the meeting started and the power did not come back on until 30 minutes after the block was over. 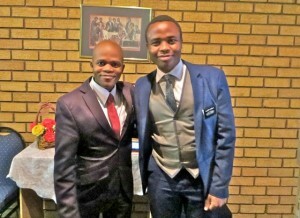 I guess wanted us to be warmed by his spirit and it worked. 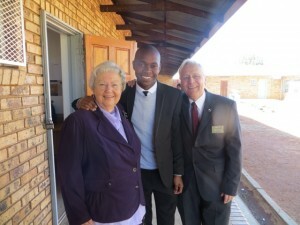 Above is president and sister Kwaikwai who had a few moments together for a photo. 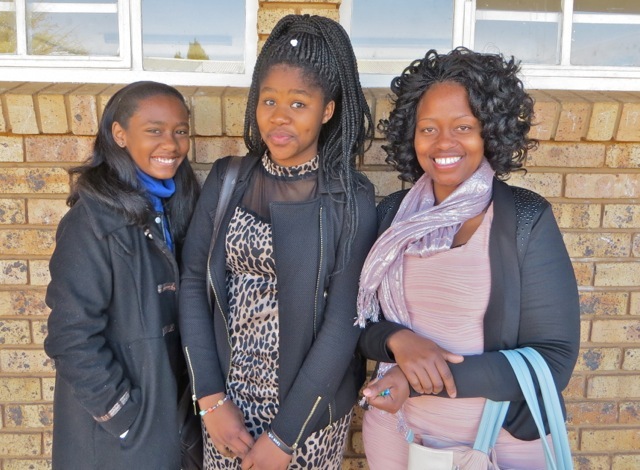 Three of the lovely young women in the branch posed for the next one – sisters Kruger, Lekebe and May. 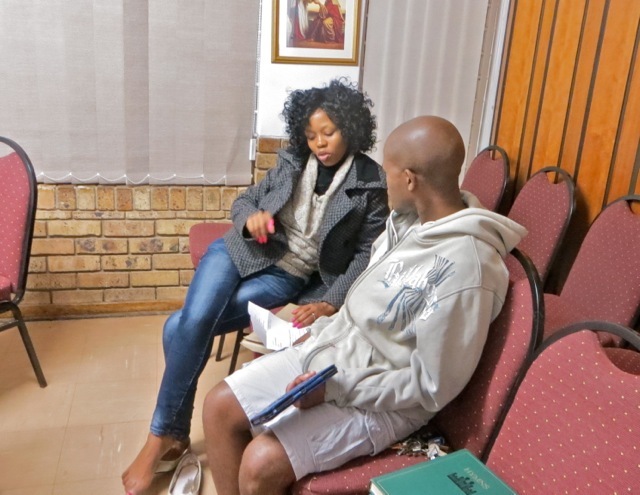 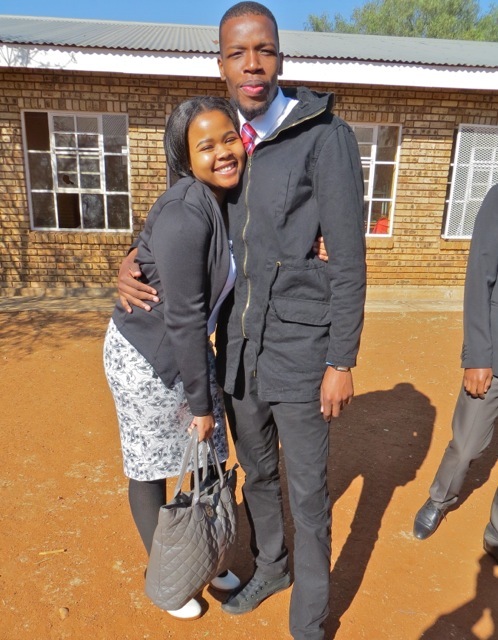 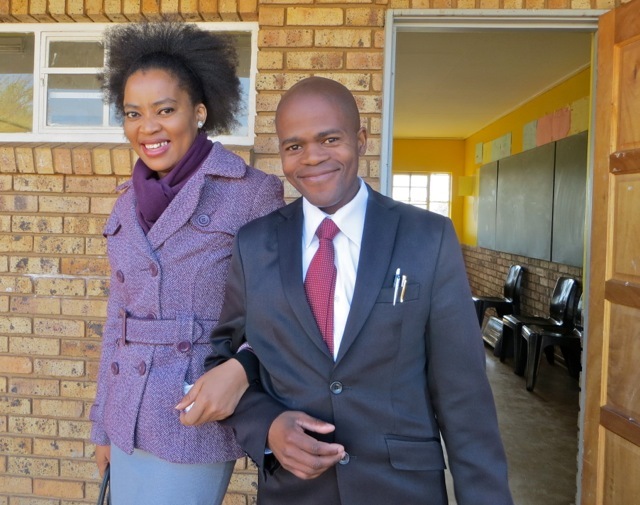 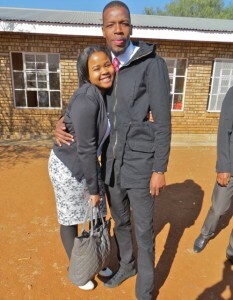 Below we have brother Menzi with sister Amos – I try to get Menzi with a different lady each week. The warmest place was out in the yard in the son so there were a number of gatherings including the one of the PH with sister Ntabising. 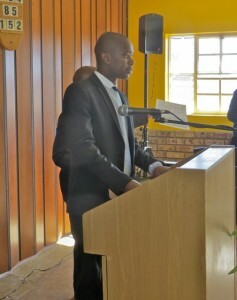 We were glad to have Bongani Buti visiting the branch. 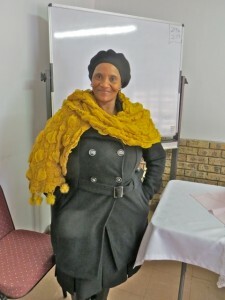 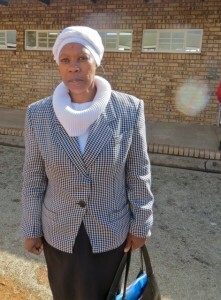 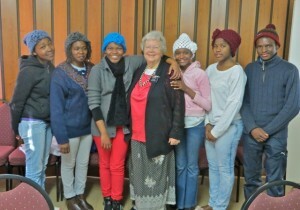 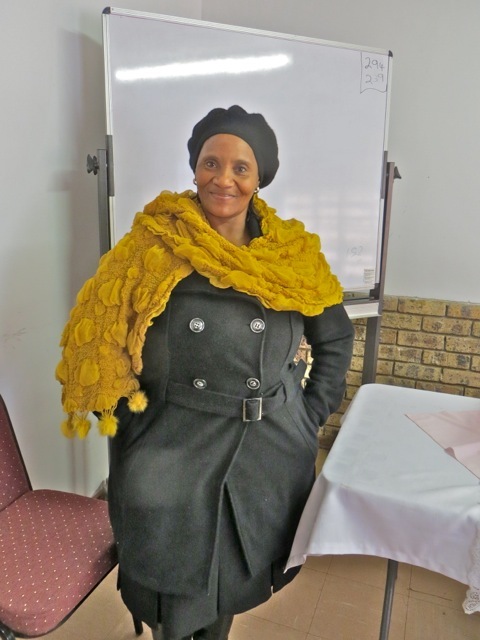 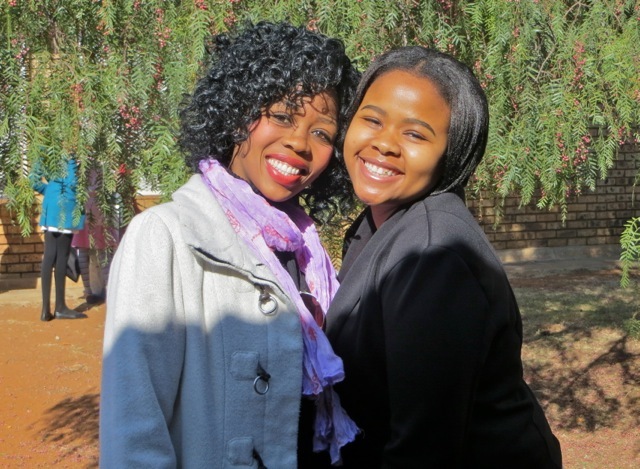 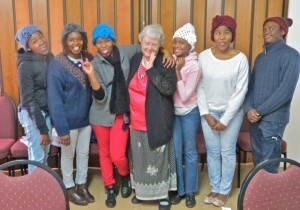 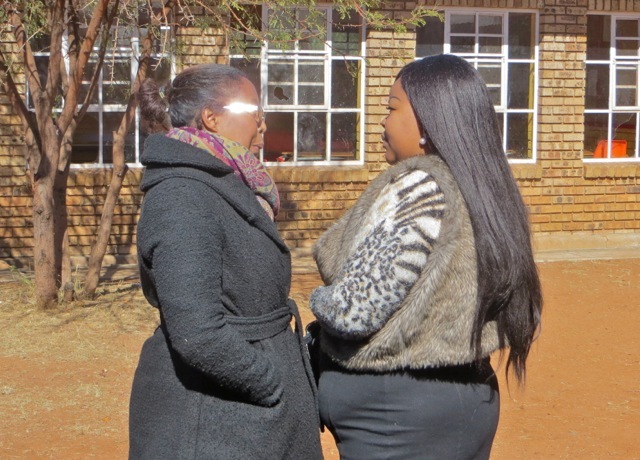 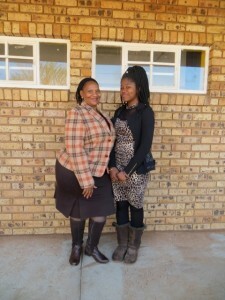 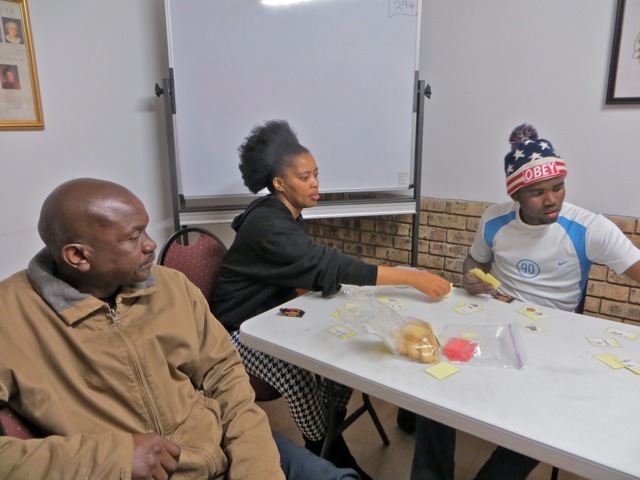 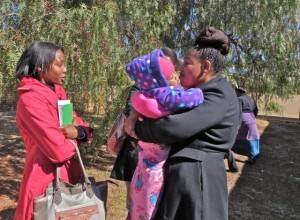 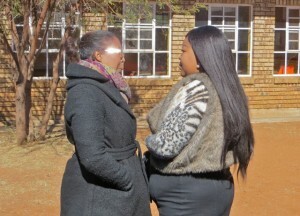 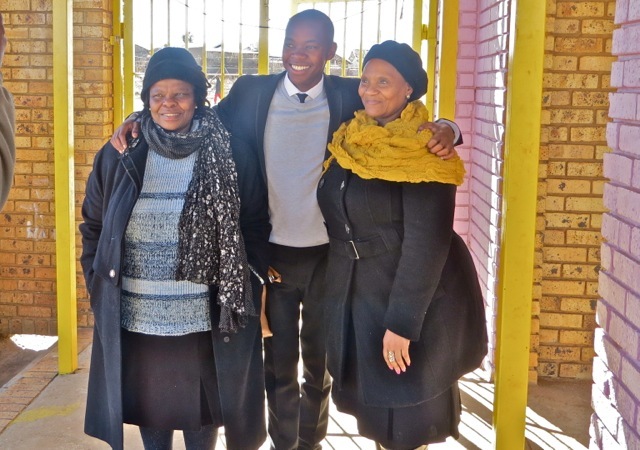 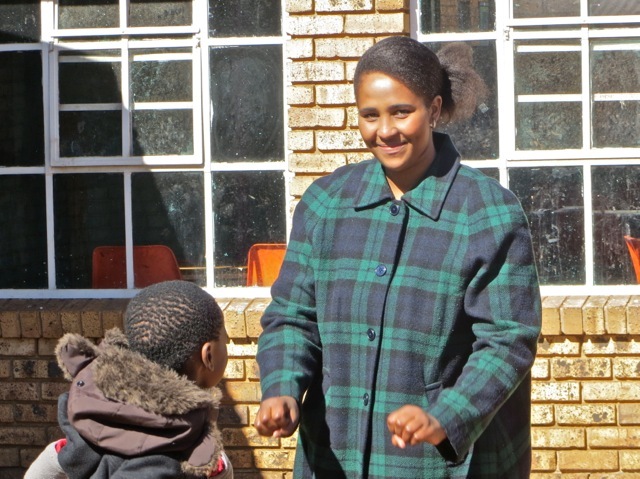 If you look through the blog you will see that I often have a photo of sister Thulo – she is joined in the other two by sister Khanye Lekebe. 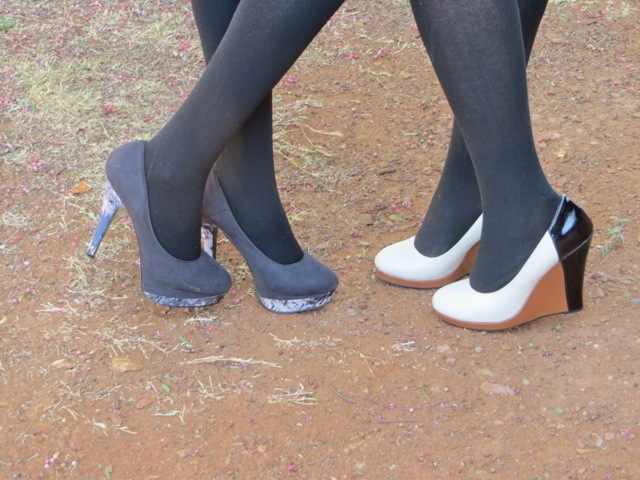 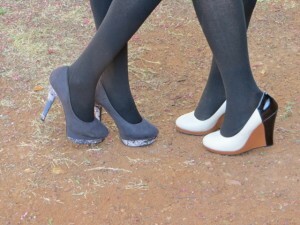 Sisters Ratema and Kea show off their smiles and also their oh so tall high heels. 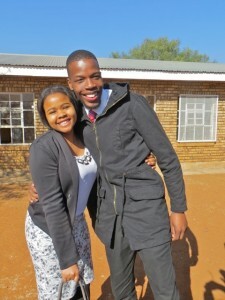 Below Sister Ratema with brother Omphile. 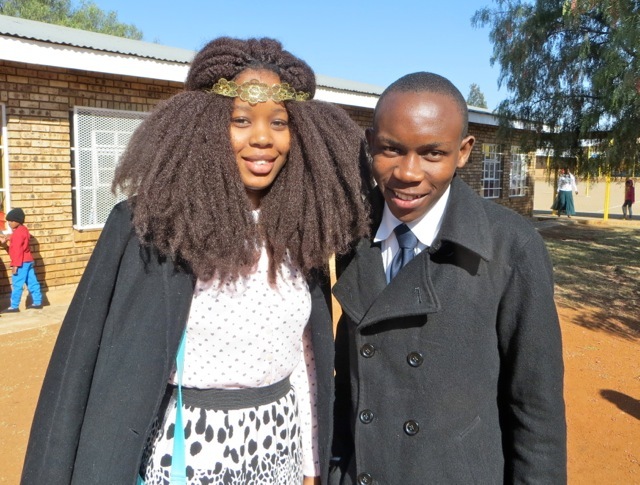 While his main girl, sister Kea gets even by posing with Bongani Buti. 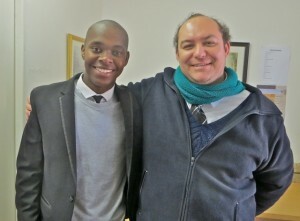 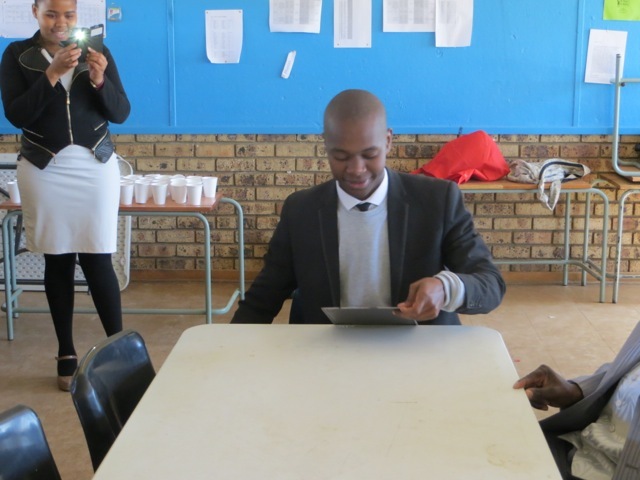 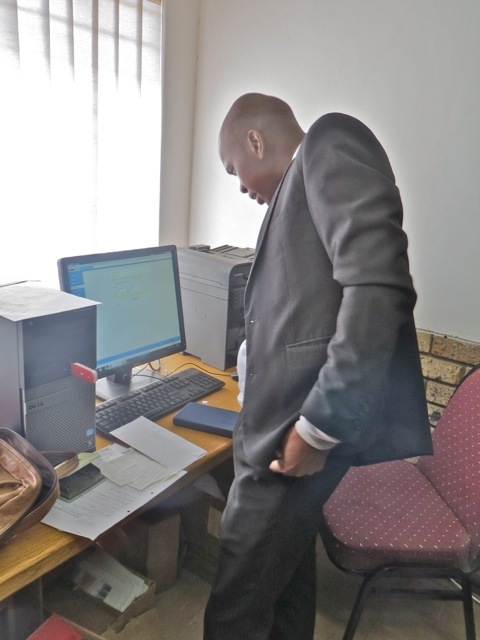 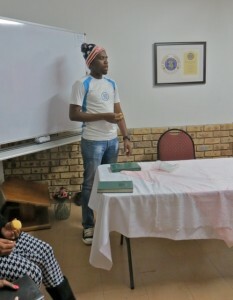 Bongani served as my counselor until he got a job up in Pretoria so he knows the branch members well. 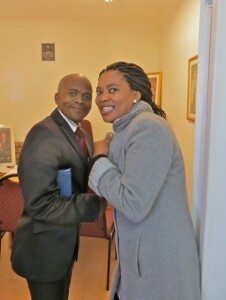 Then we got the two love birds together for a photo. 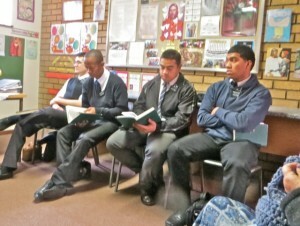 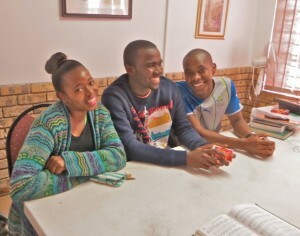 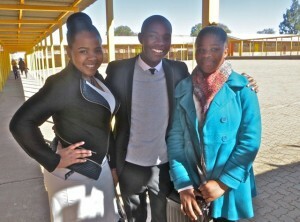 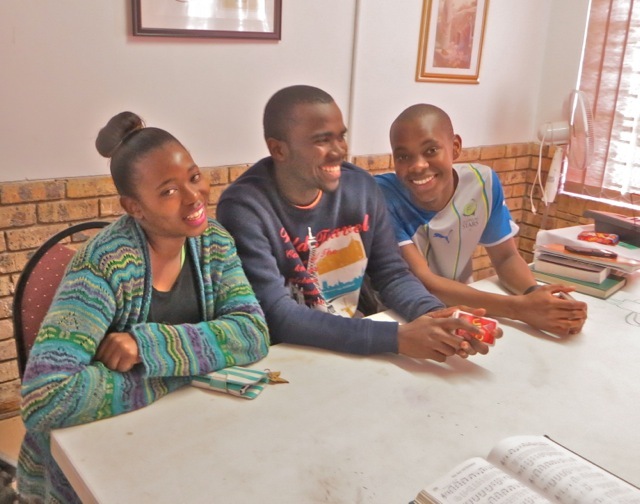 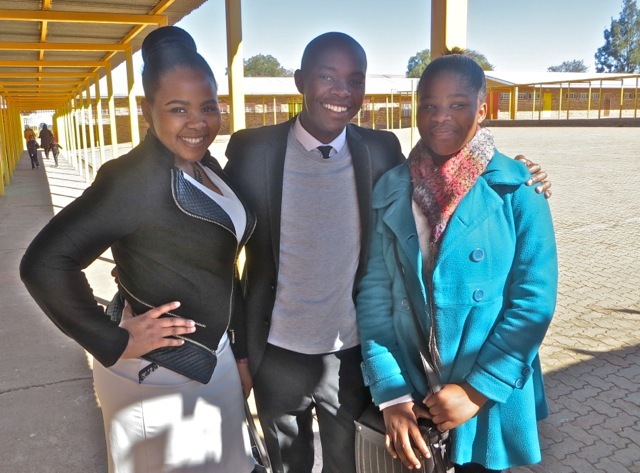 In the last photo in this series we find sister Kwaikwai joining brothers Omphile and Bongani as well as sister Ratema. 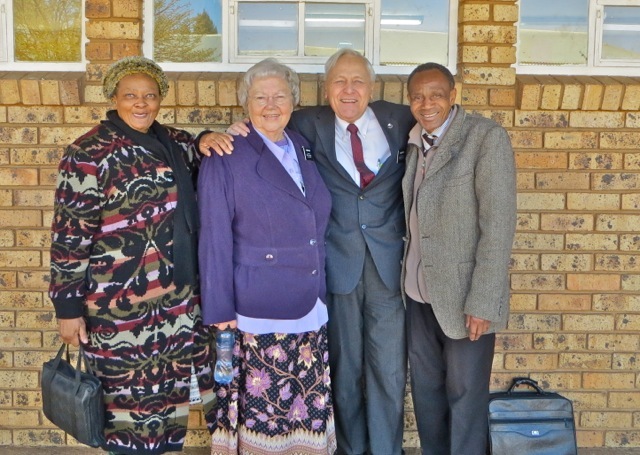 The branch is blessed to have a very active Primary that is watched over by a great Primary presidency of sisters Georgina, Viona and Merriam. 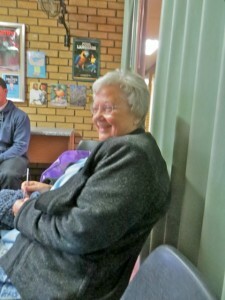 Mary plays the keyboard for sharing time and then does the same for Relief Society. 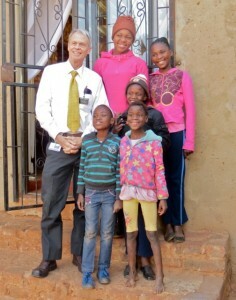 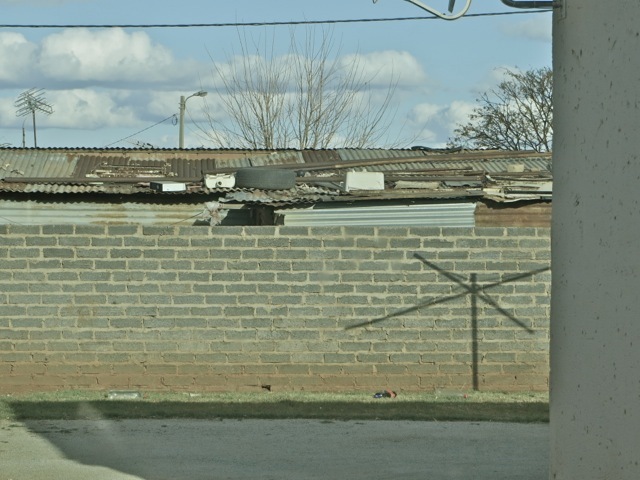 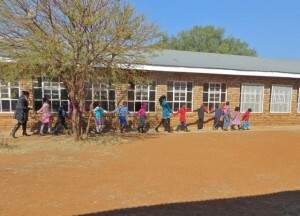 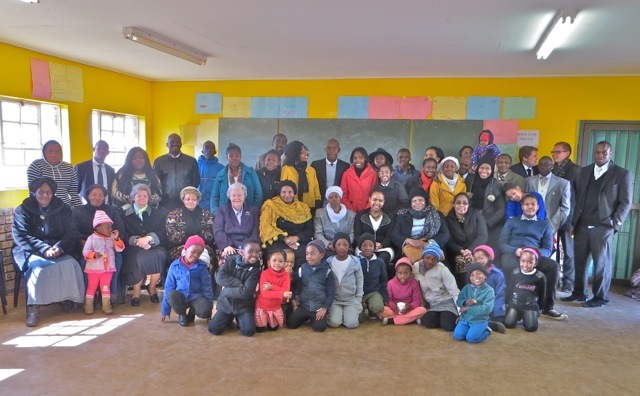 This entry was posted in Johannesburg Mission - Back To Africa on July 19, 2015 by Bill. 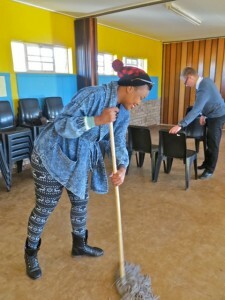 Since we hold our sacrament and other meetings in a room where there are school classes, each week a different group of members have an assignment to clean and wax the floor and then set up the room for the meeting. 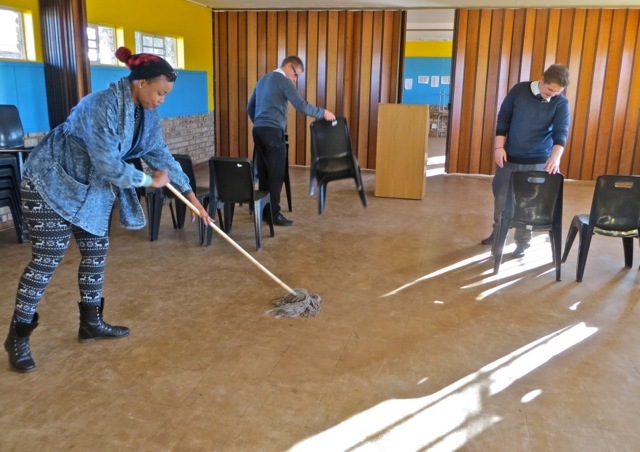 They also clean the bathrooms – not always a pleasant task at the best of times, and a couple of other rooms. 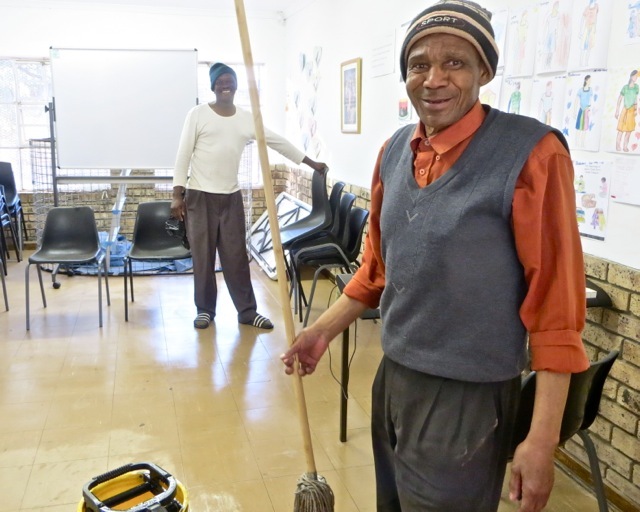 The Tlotleng group have never missed a cleaning assignment! The crew today included sister Renny Motha who shows below her excellent mopping skills while elders Hentunen and Wild start setting up the chairs. The bottom photo is of brothers David Rampai and Simon Tlotleng cleaning and setting up the Primary room for the children. While the crew was cleaning, Institute class was being held in another room. 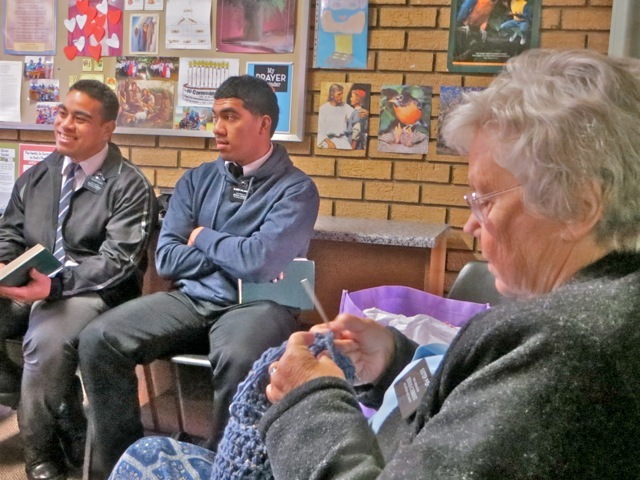 I did not get a photo while the class was going on but I did get some of class, plus sister Renny who had turned in her mop, afterwards as they were preparing to play some wicked games of UNO. They take playing very seriously but you could not tell from all the smiles and laughter. 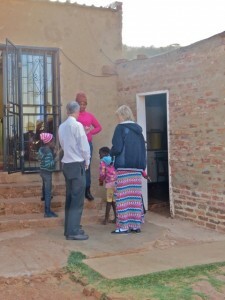 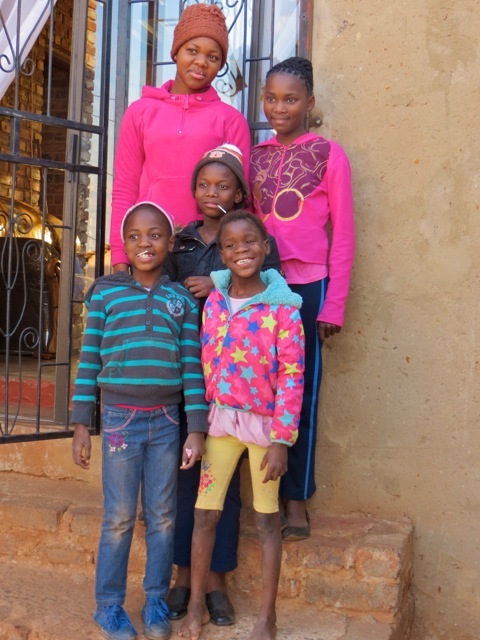 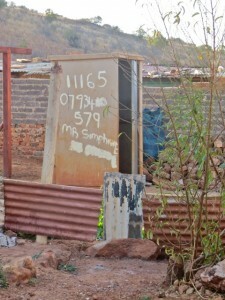 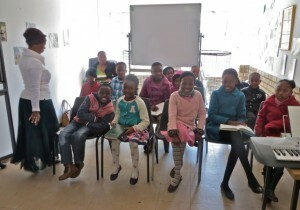 This entry was posted in Johannesburg Mission - Back To Africa on July 18, 2015 by Bill.